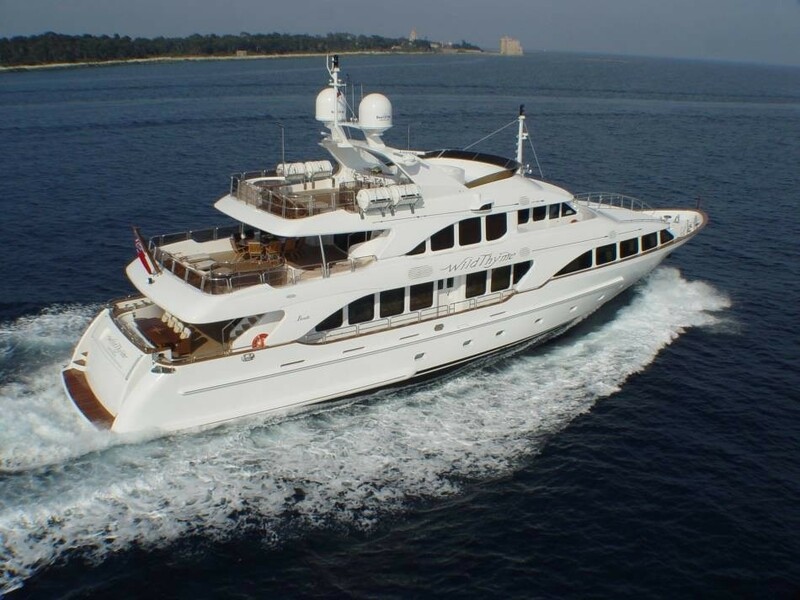 Luxury Mediterranean charter yacht AURA is a modern Benetti 36 meter motor yacht with an interior designed by Lynn A. Cullen. 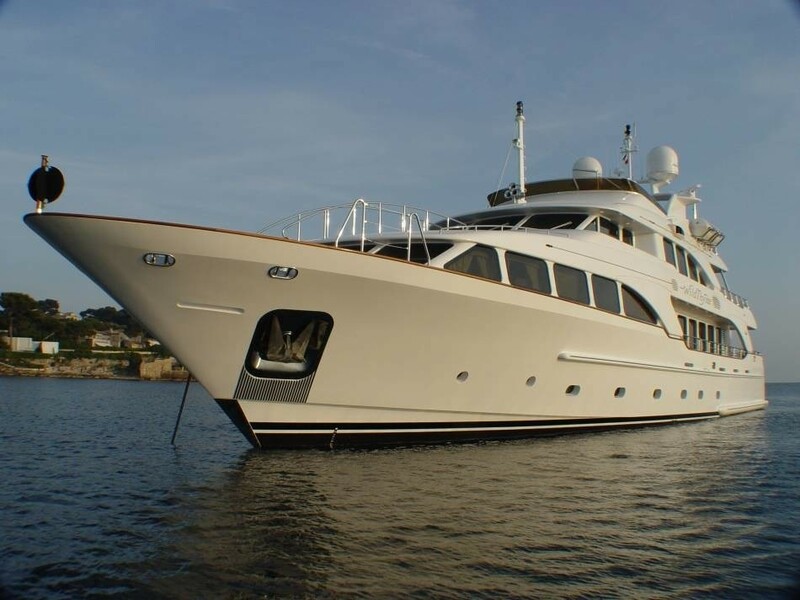 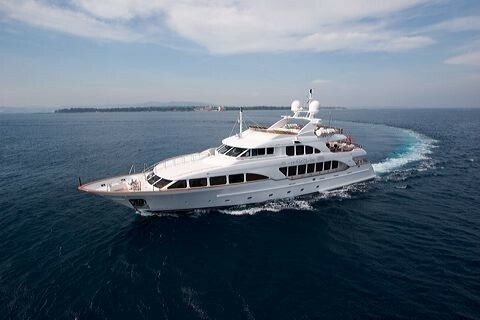 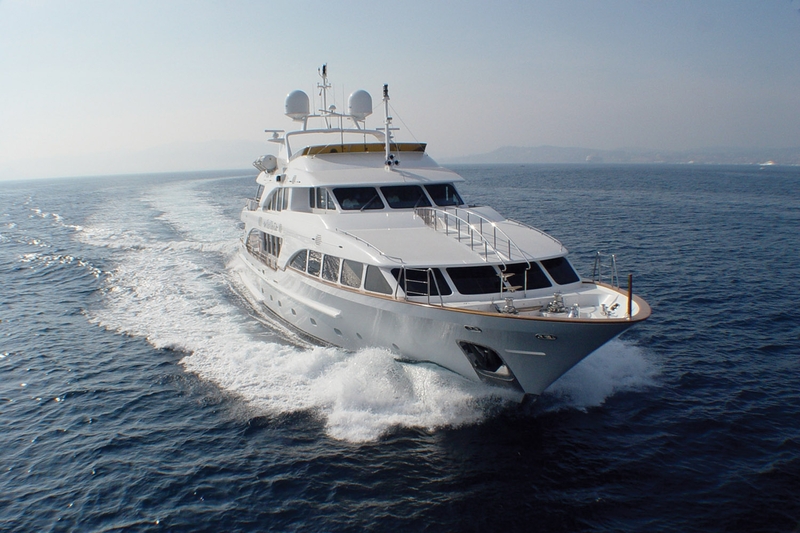 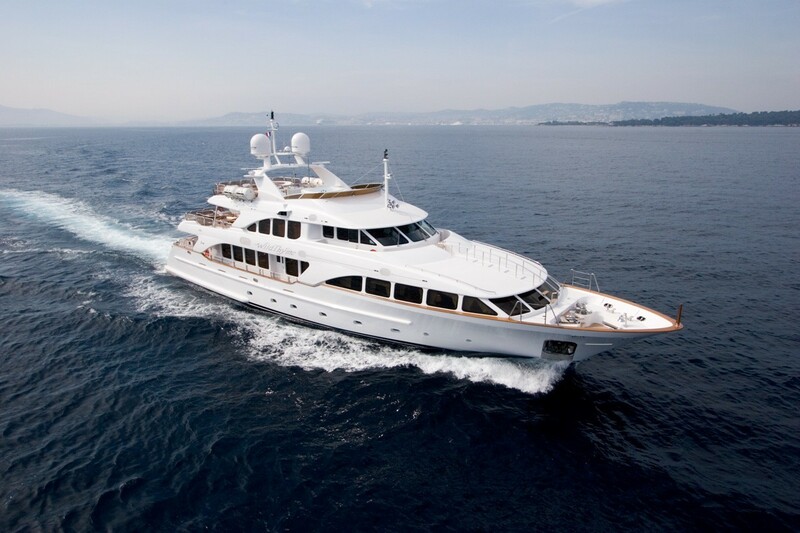 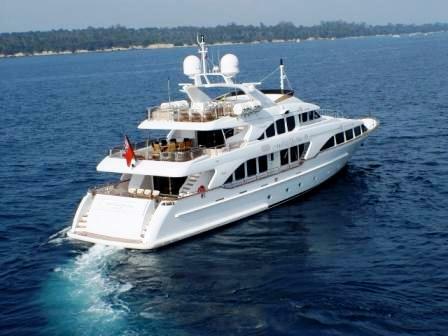 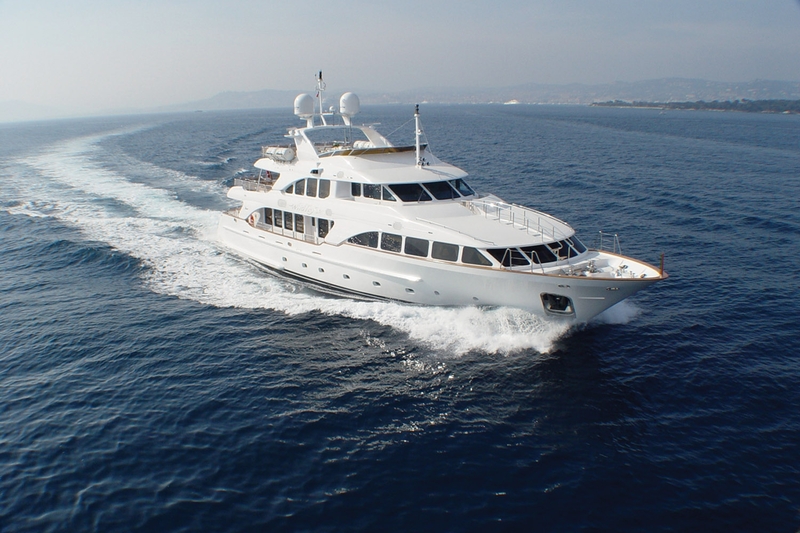 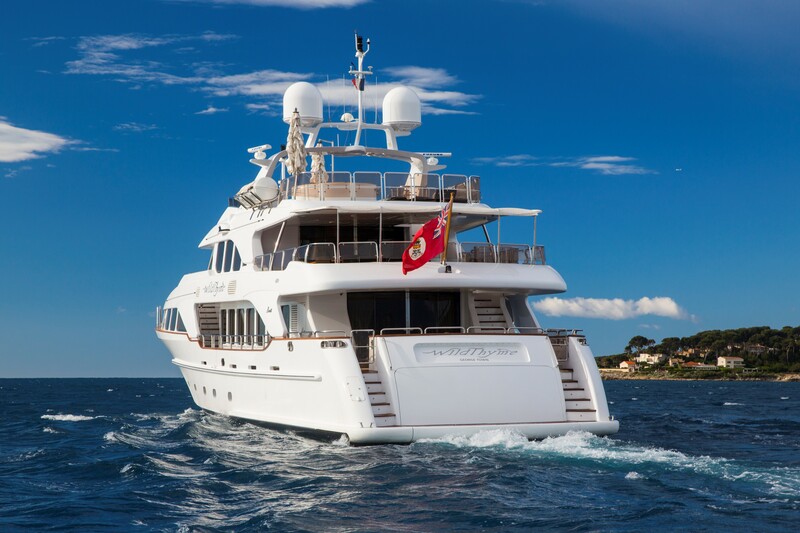 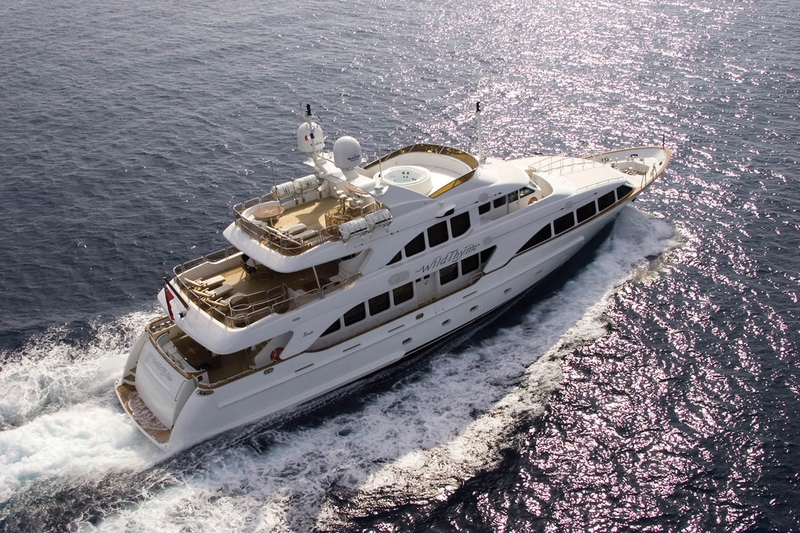 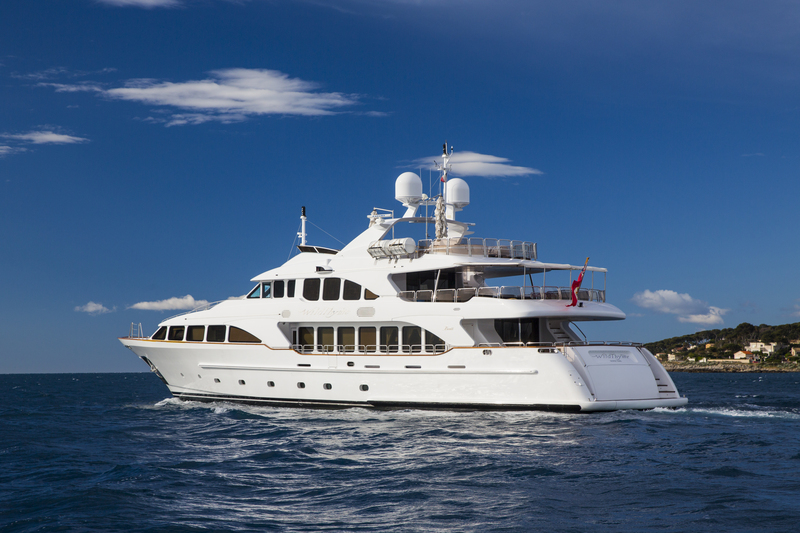 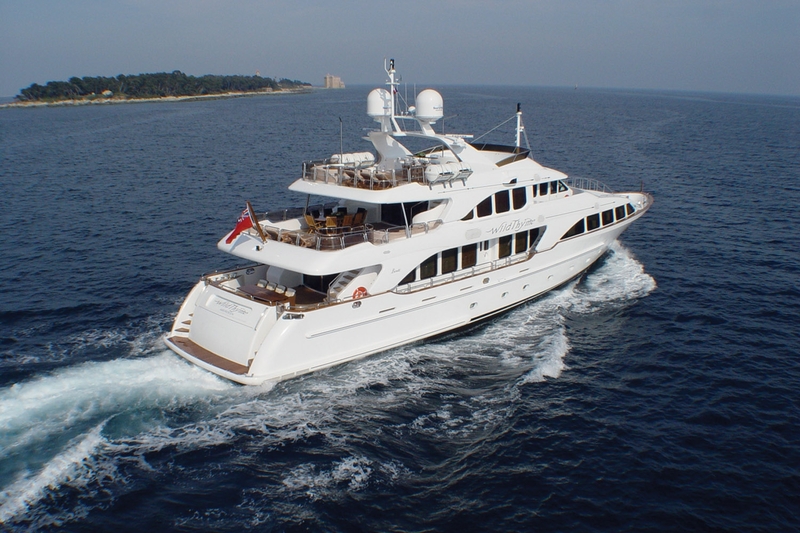 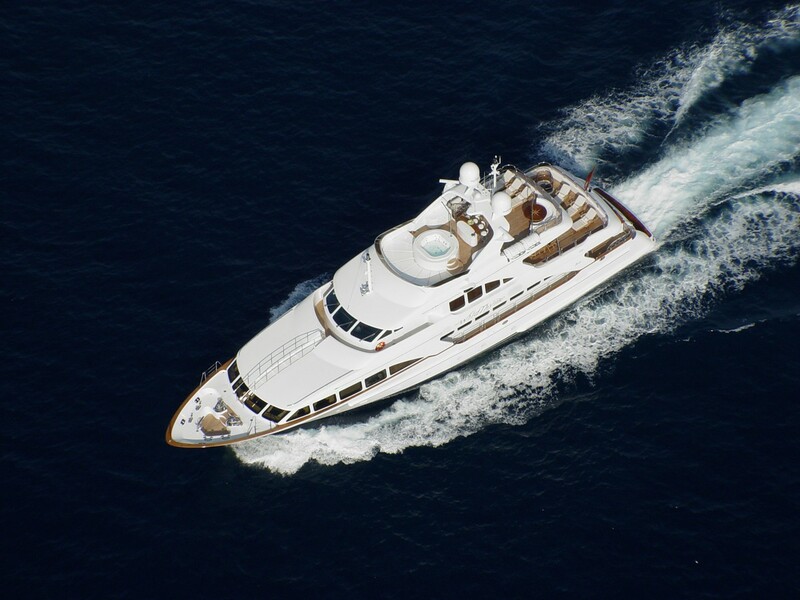 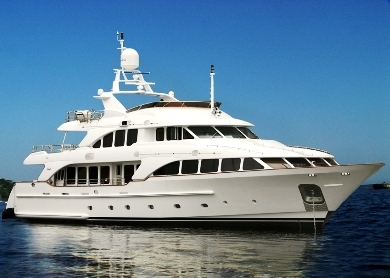 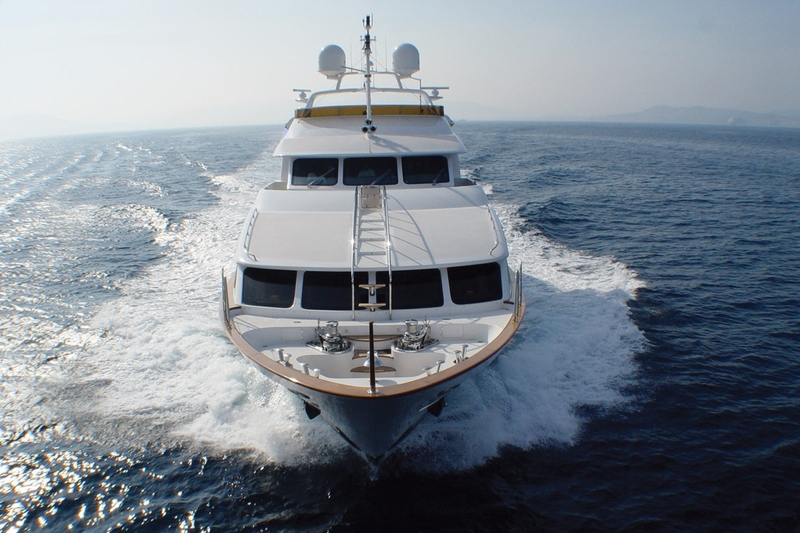 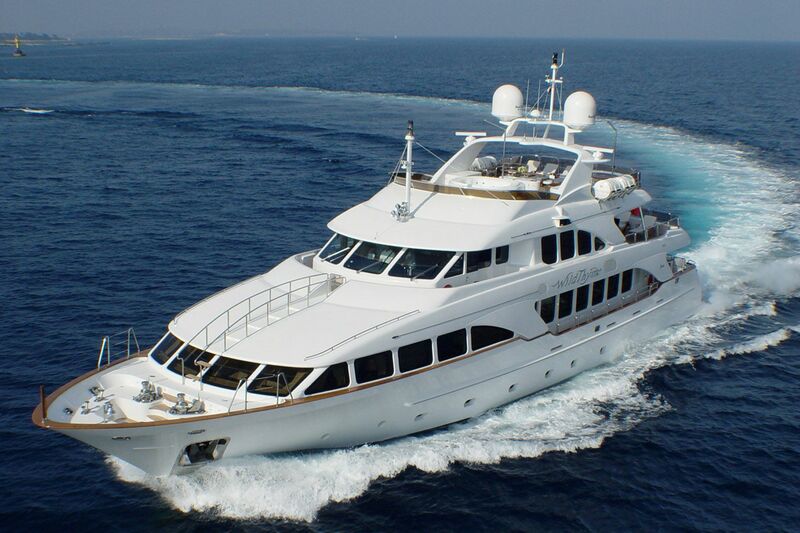 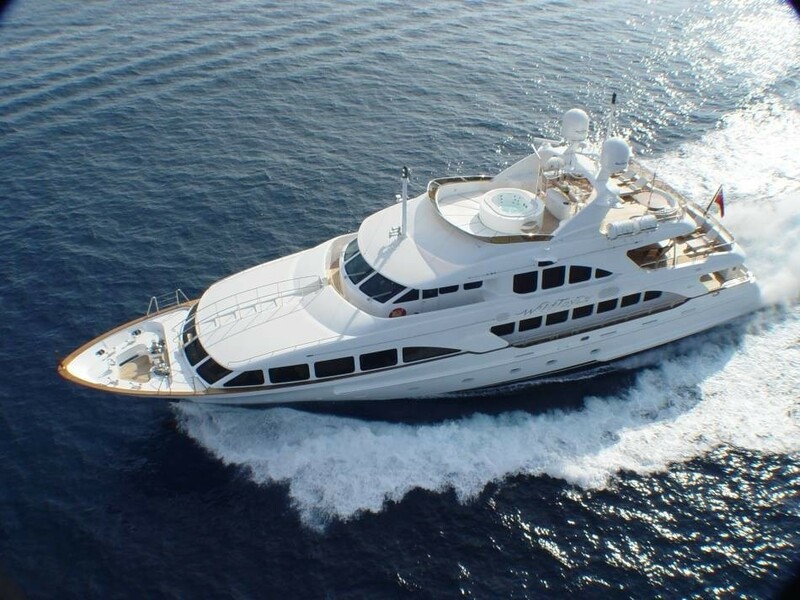 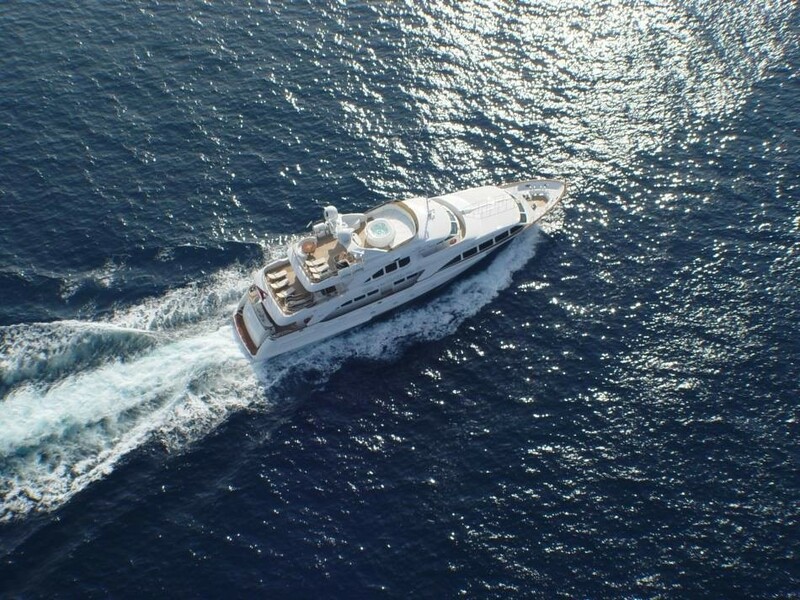 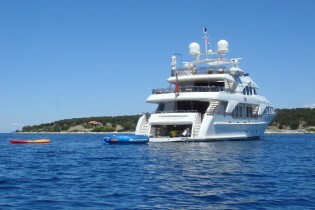 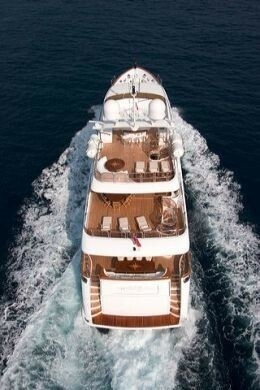 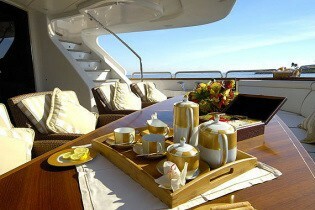 M/Y AURA is equipped with an ultra-modern stabilization system which operates even while at anchor. 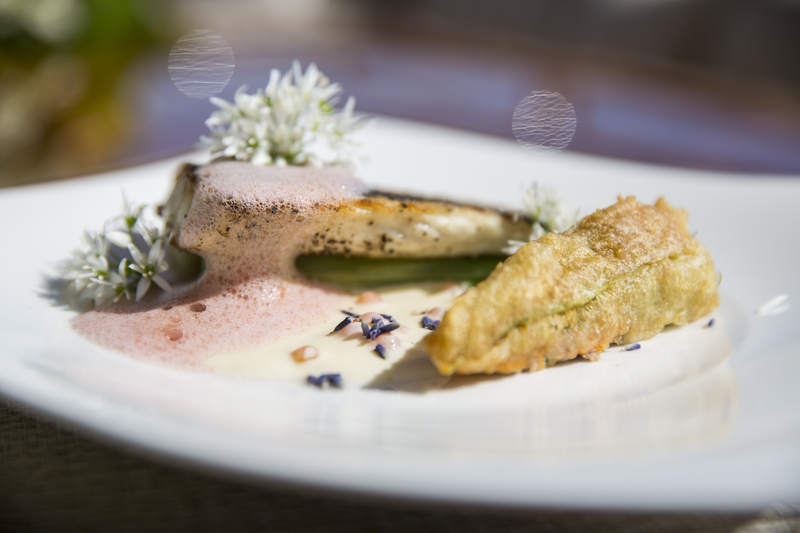 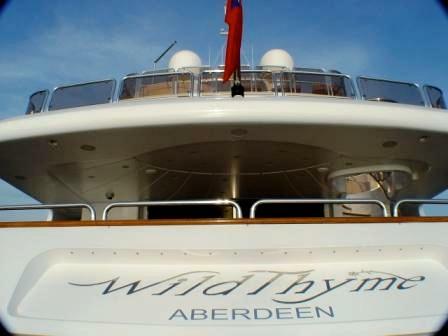 Wild Thyme also boasts the very latest audio-visual equipment, Satellite television and IPod docking stations throughout the yacht in both indoor and outdoor areas. 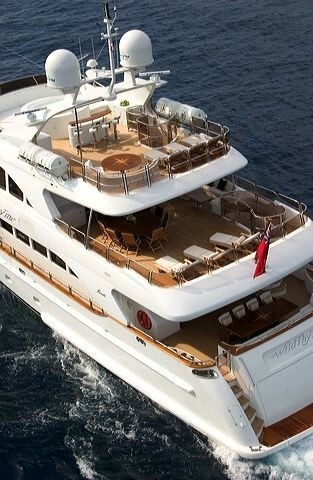 She is fully MCA accredited. 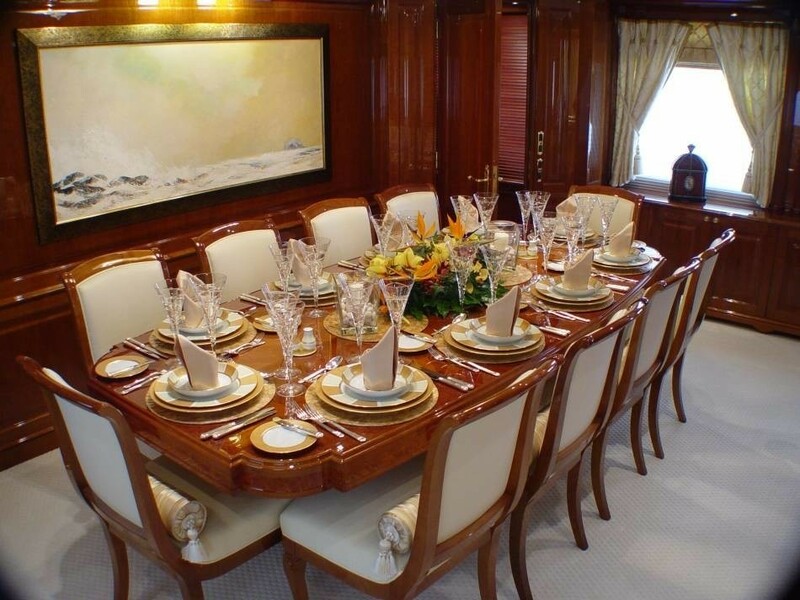 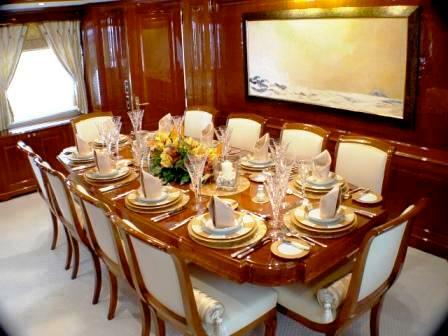 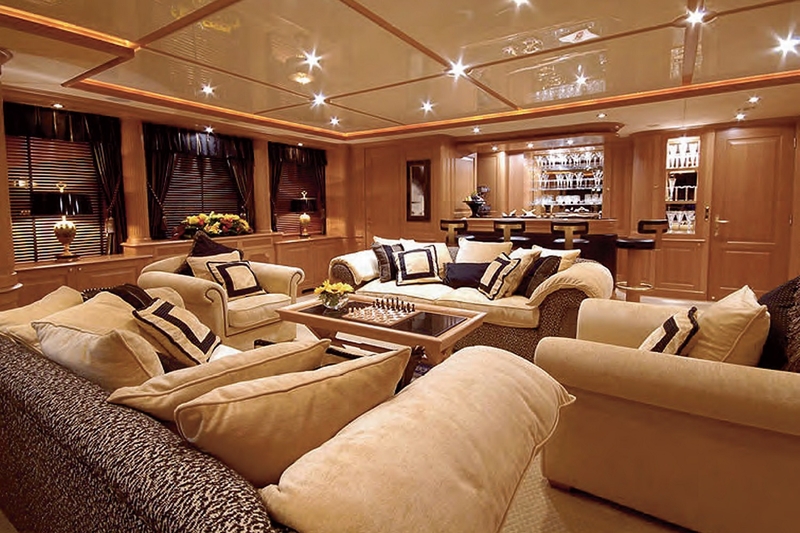 The AURA motor yacht features a warm elegant interior décor, of high gloss cherry wood panels and neutral soft furnishings. 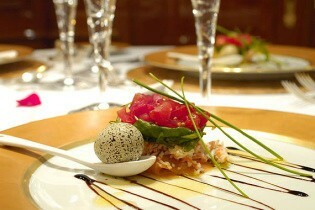 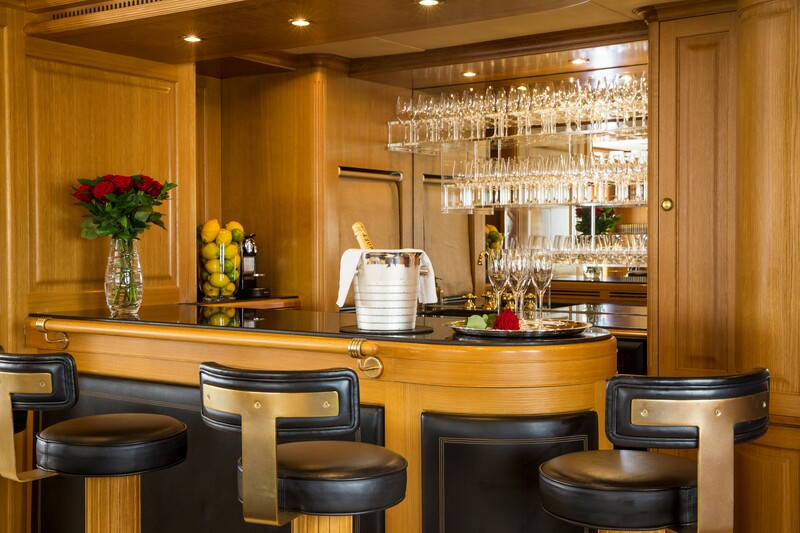 The salon is spacious, boasting ample seating and tables, perfect for social entertainment. 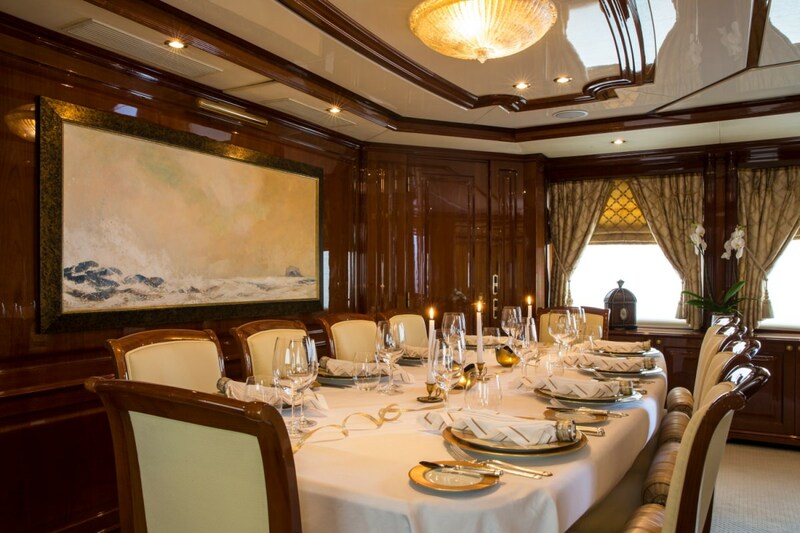 A center column gives slight separation to the formal dining area forward, creating an intimate, relaxed ambiance. 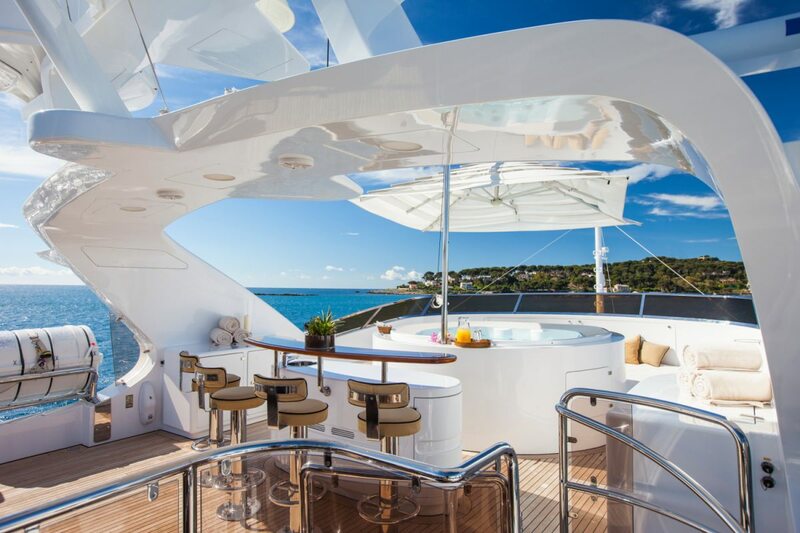 Above the main deck, charter yacht AURA has a well-appointed sky lounge, which makes a fabulous social hub, thanks to the comfortable seating tables, wet bar, state of the art entertainment and direct access to the upper aft deck. 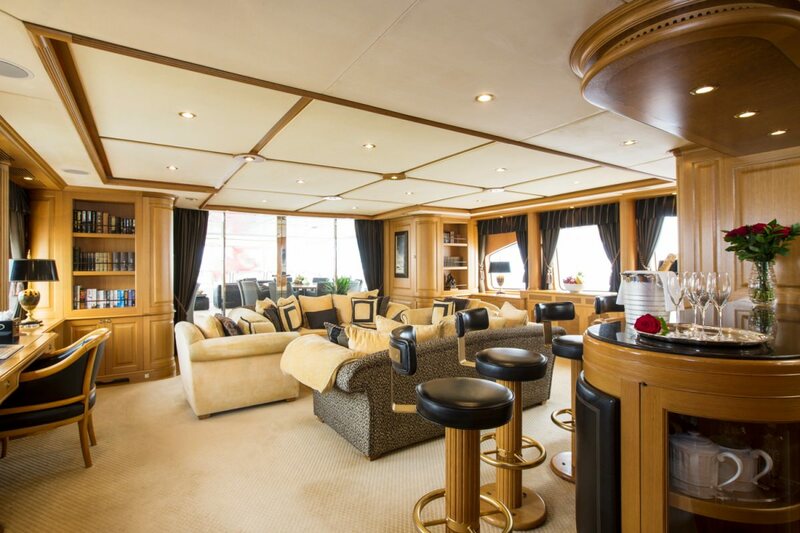 Guest accommodation is offered in the full beam master cabin forward on the main deck and 4 generous guest cabins, on the lower deck. 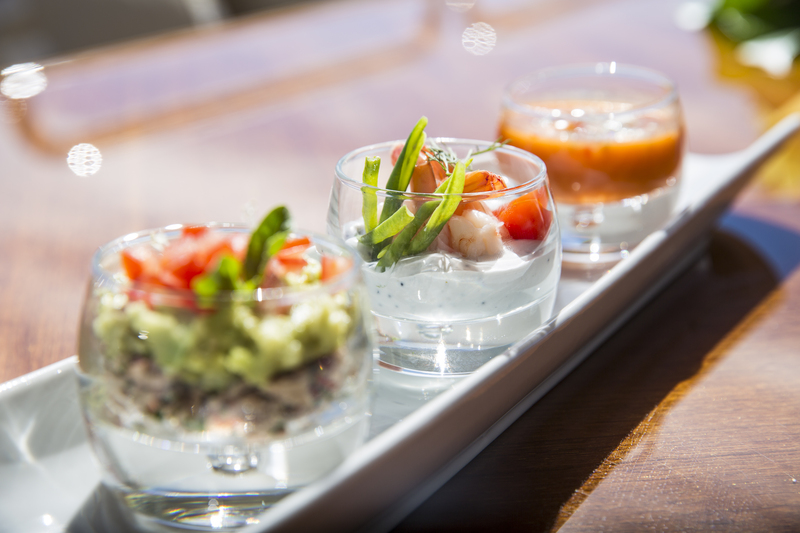 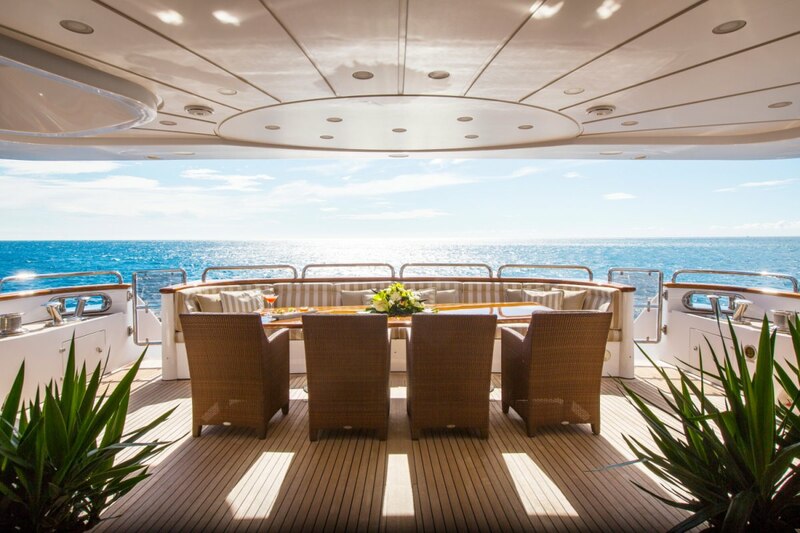 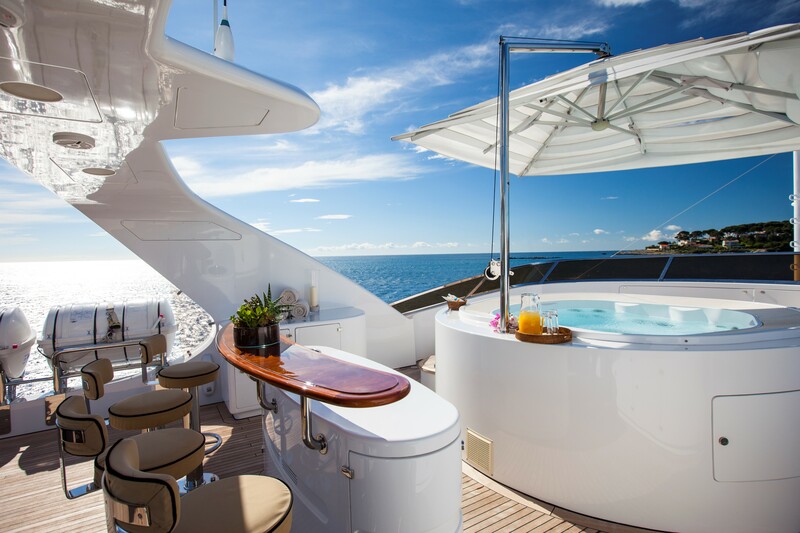 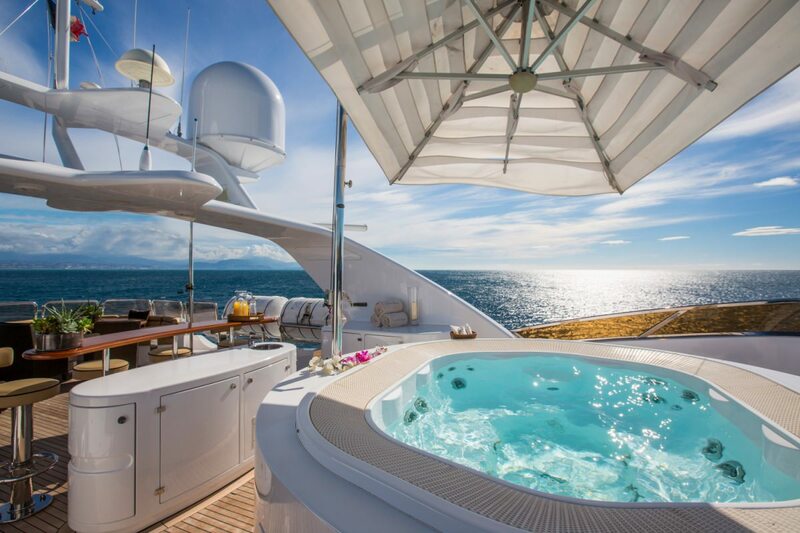 Exterior living on 3 decks ensures plenty of choices whether M/Y AURA’s guests wish to relax or entertain. 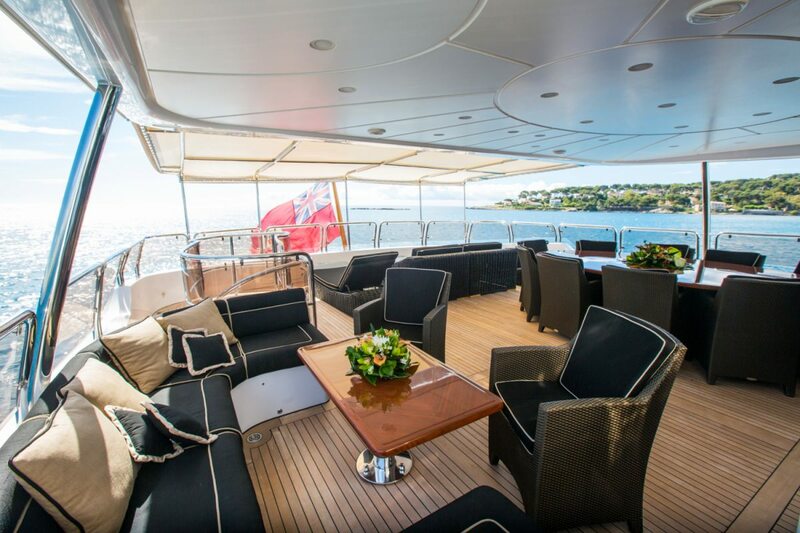 On the main deck, aft of the salon, wide sliding glass doors give way to a spacious and shaded aft deck, offering ample seating and an alfresco dining option. 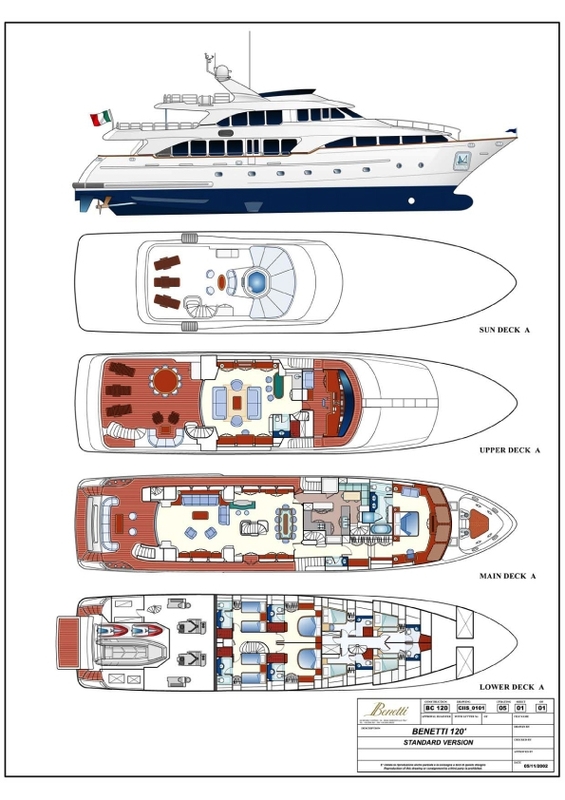 Water enthusiasts will be pleased with the extended swim platform, large tender and toys garage and abundance of sea toys on offer. 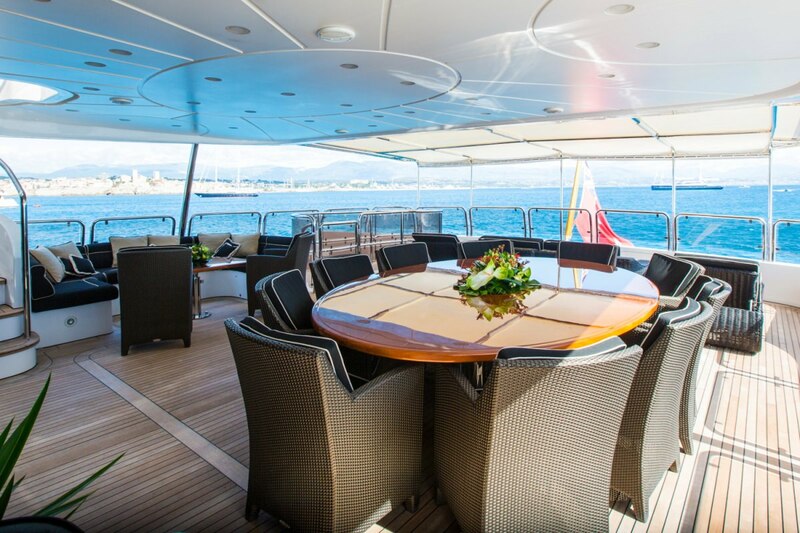 An upper deck features a further alfresco dining option, additional seating and partial shade. 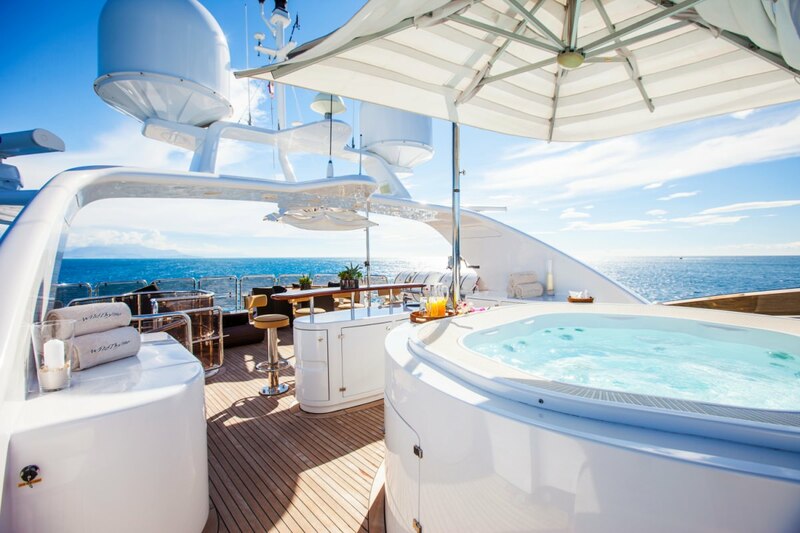 The sundeck is sure to be a hit with the sun lovers, complete with an alfresco dining area, chaise lounges, wet bar, deluxe Spa Pool tub and massive sunpad. 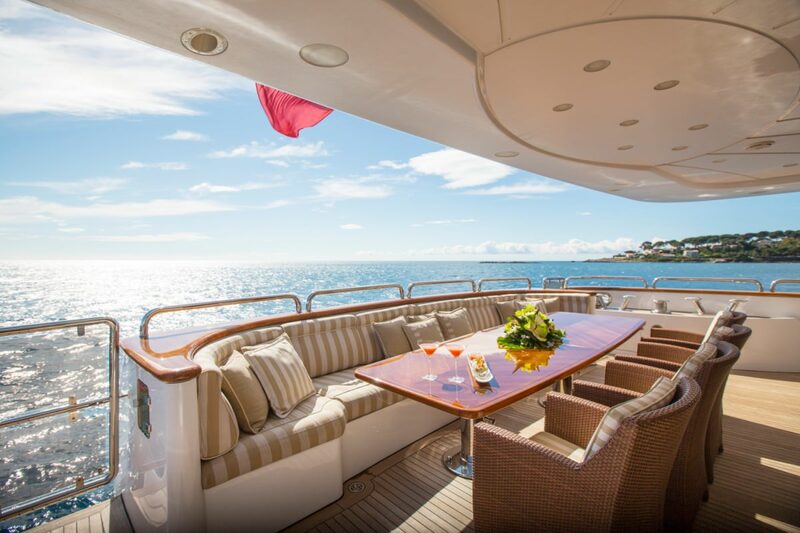 Partial shade is available for optimum comfort. 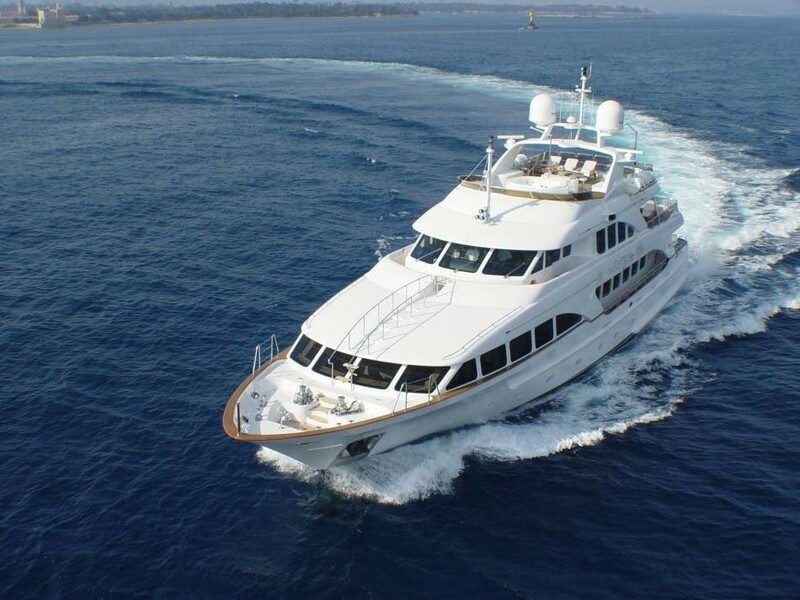 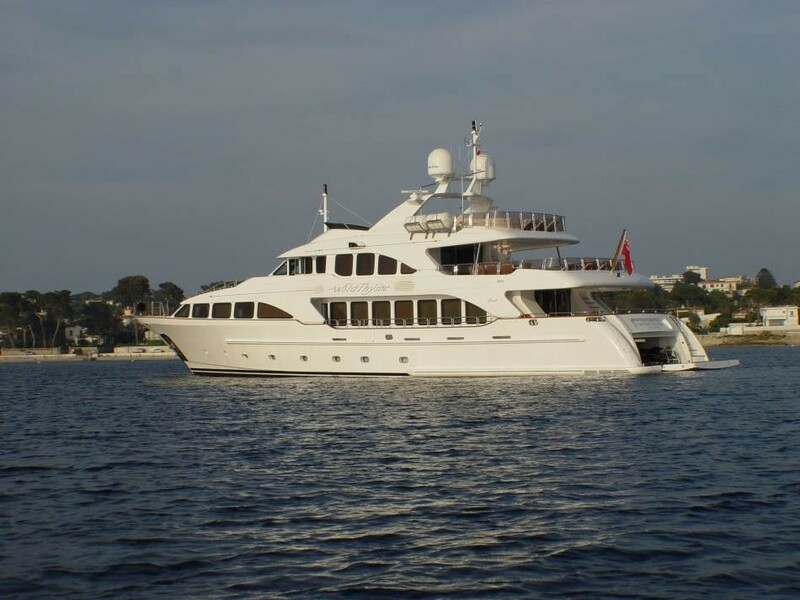 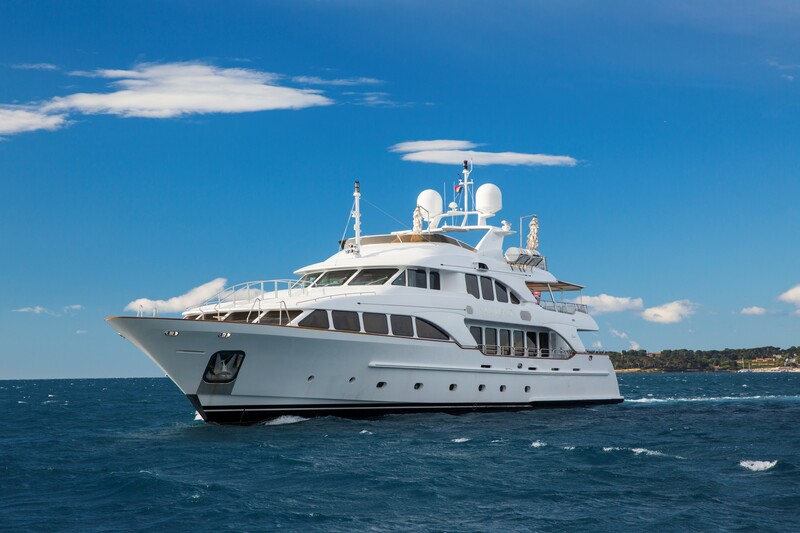 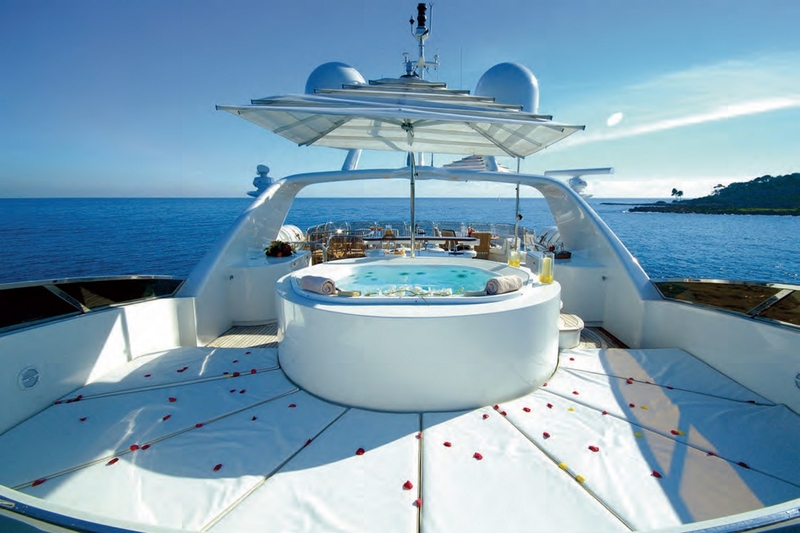 Motor yacht AURA has an extensive list of water toys and equipment to ensure maximum comfort and entertainment on your yacht charter vacation. 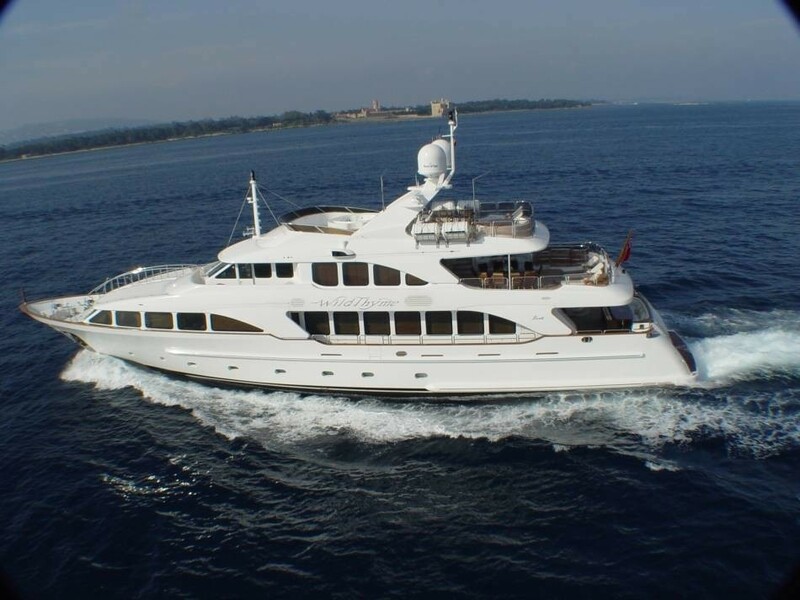 Luxury Mediterranean charter yacht AURA offers luxurious yacht charter accommodation for 10 guests in 5 beautifully appointed en-suite cabins. 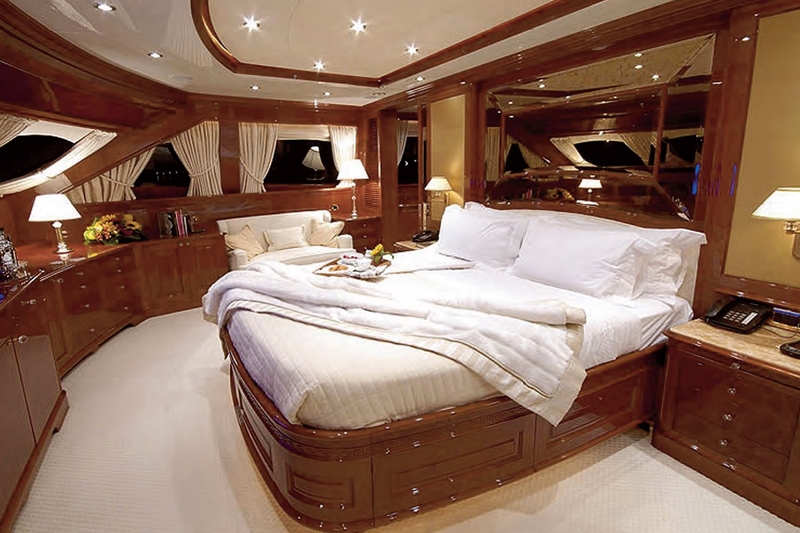 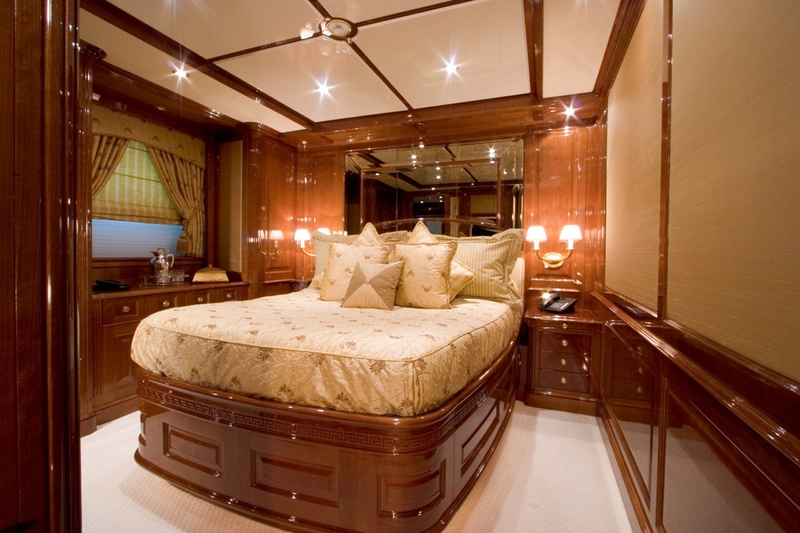 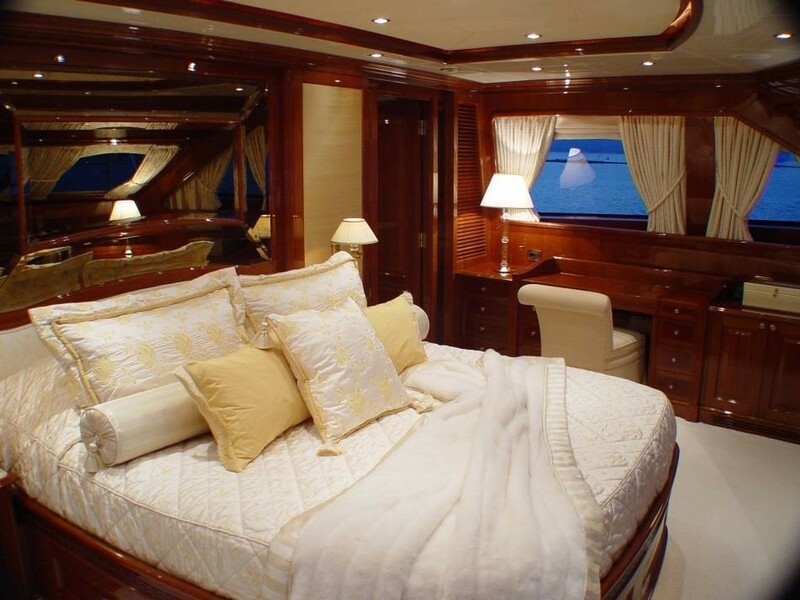 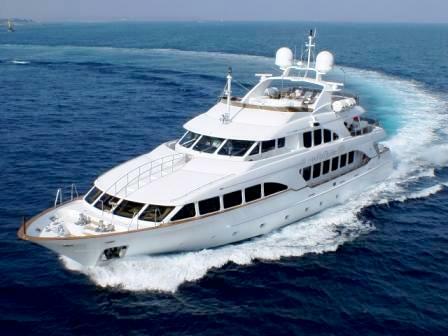 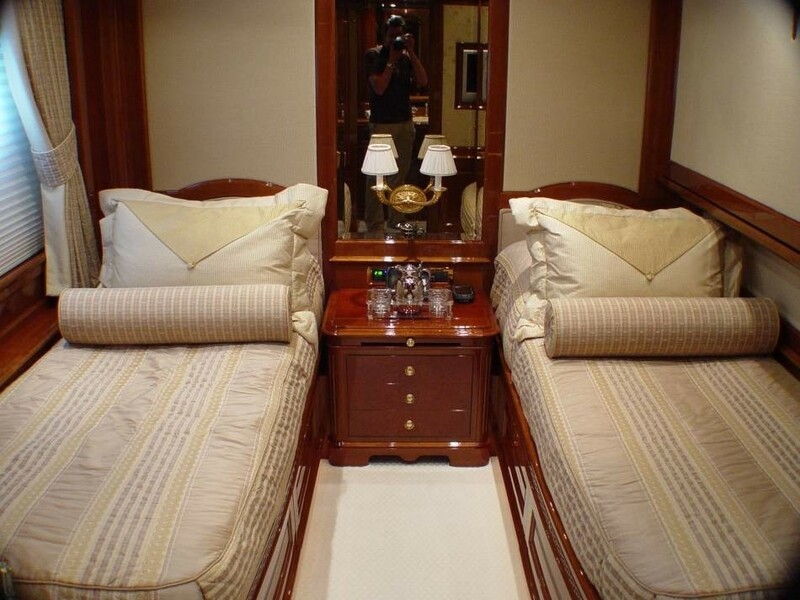 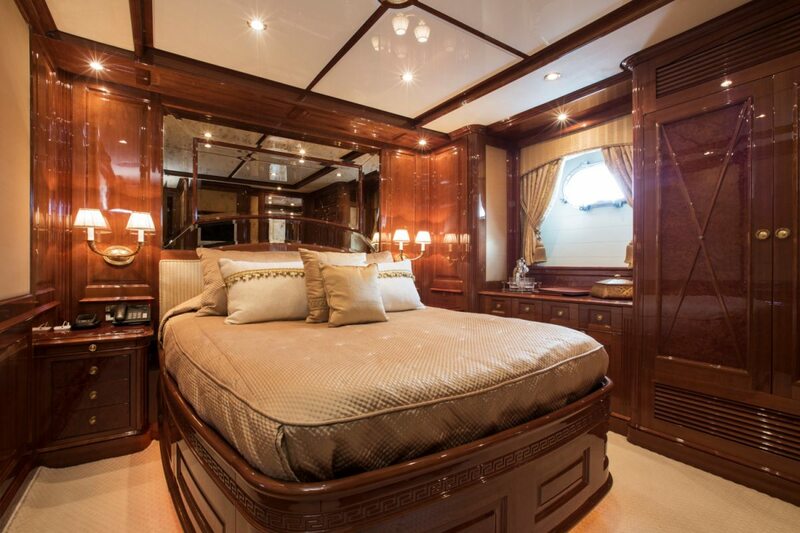 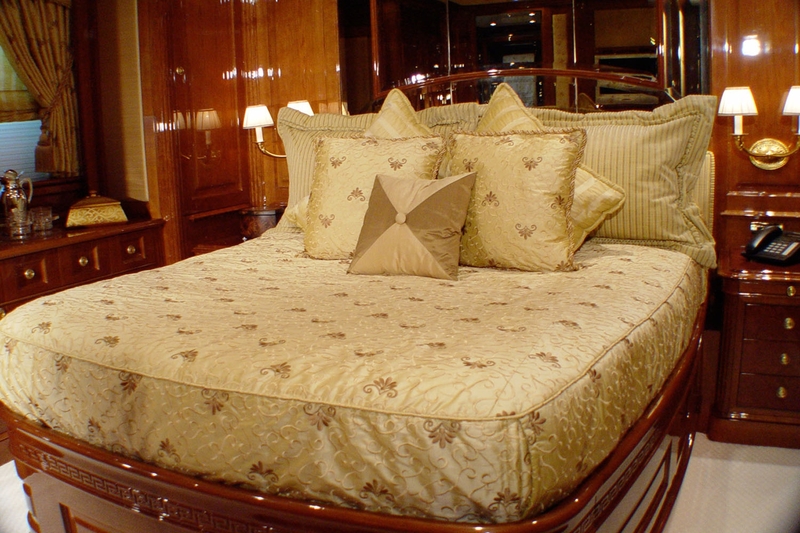 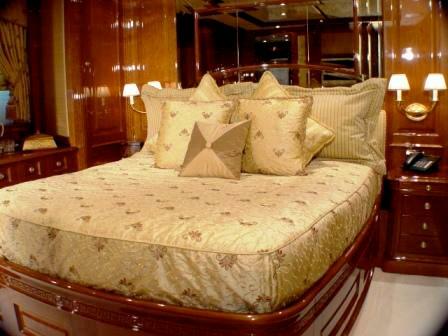 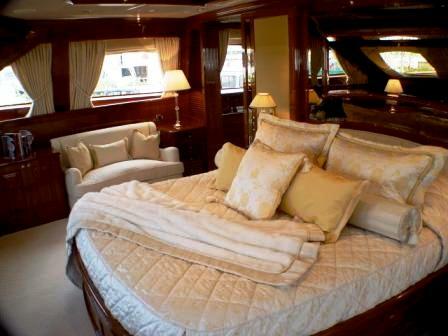 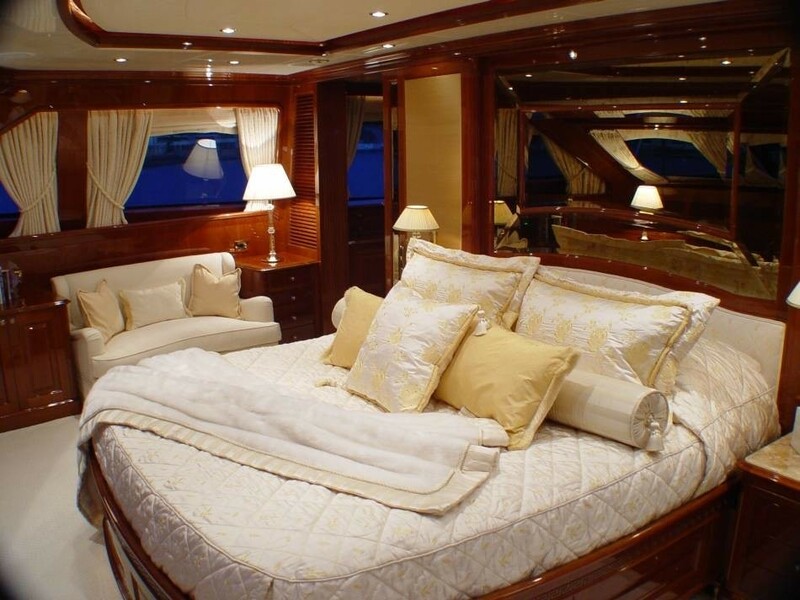 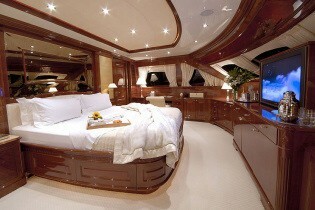 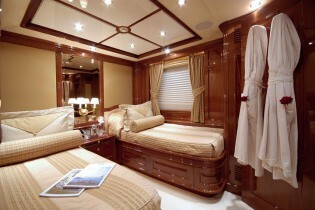 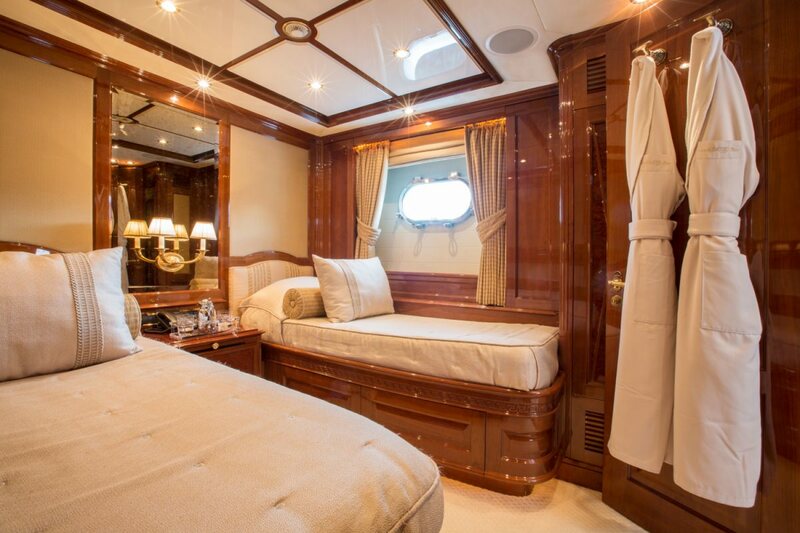 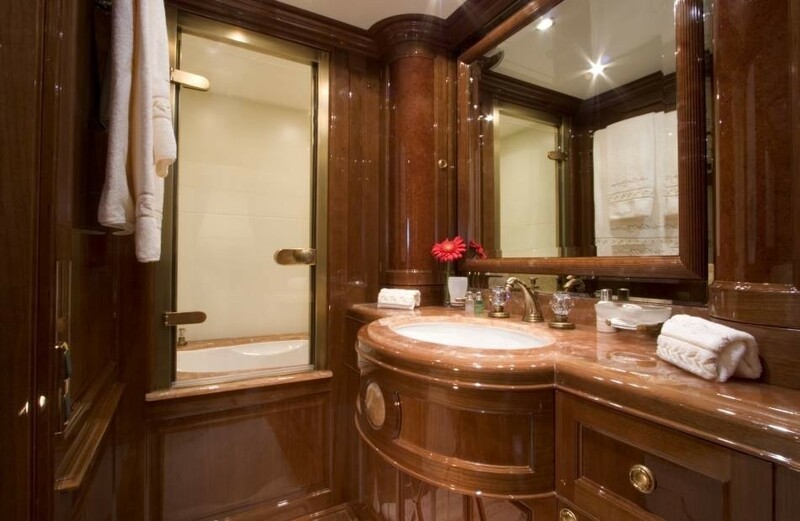 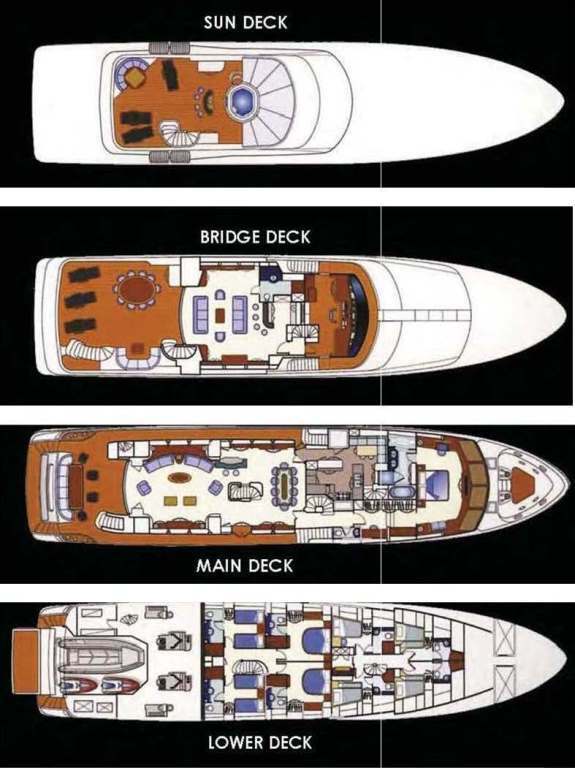 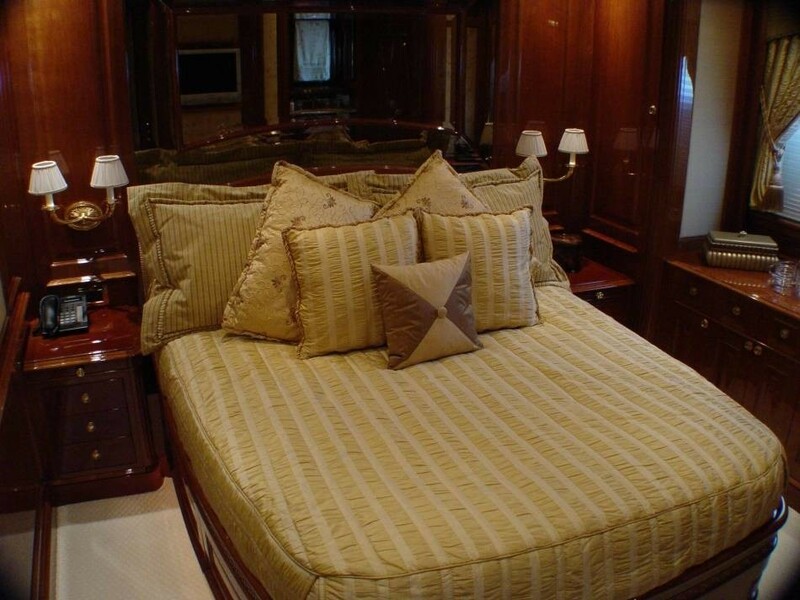 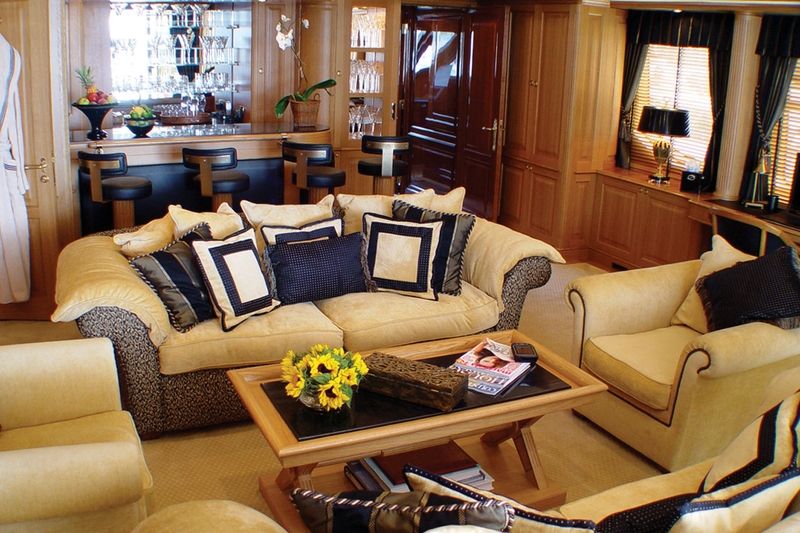 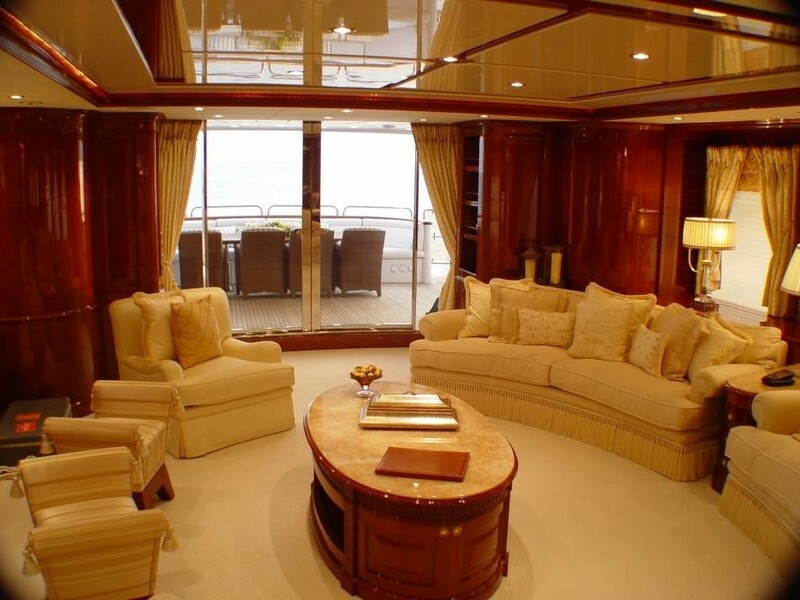 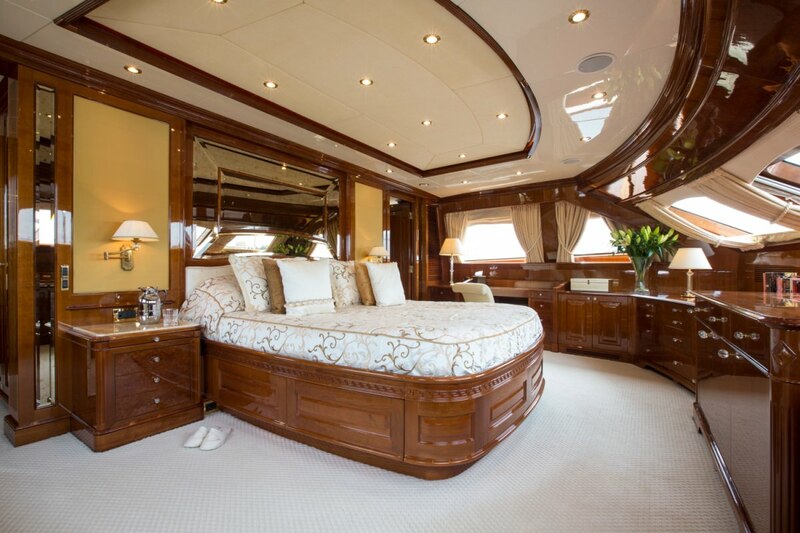 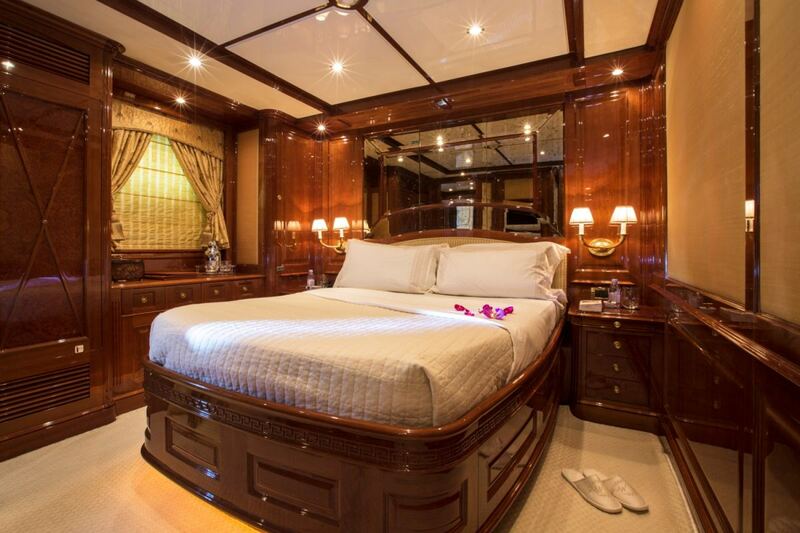 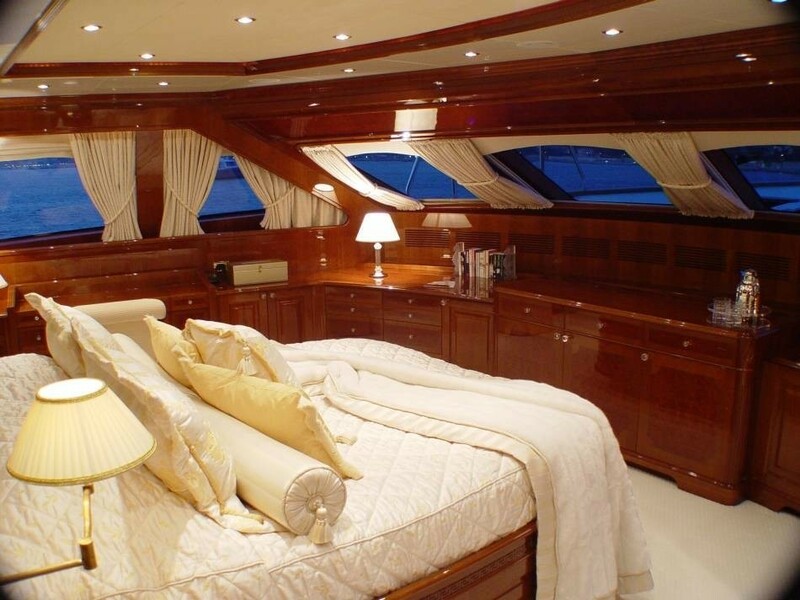 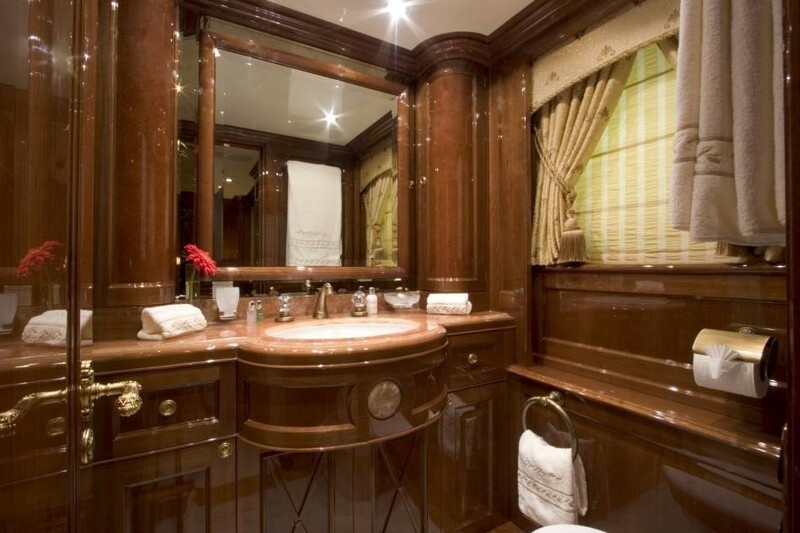 Master suite on the main deck with en-suite facilities, 2 double VIP & 2 twin cabins below deck with en-suite facilities. 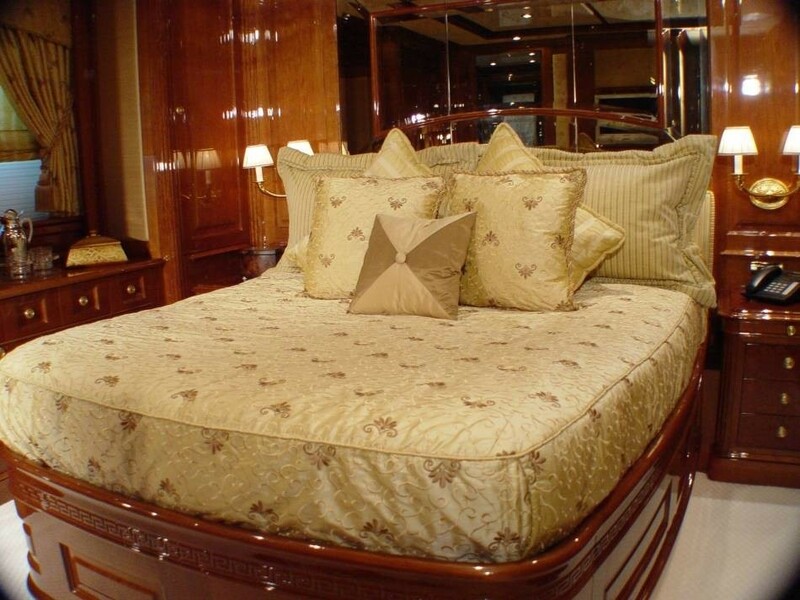 Bed sizes: Master Bed: 185 x 210 cm or (6.06’ x 6.89’), 2 VIP Beds: 155 x 200 cm or (5.08’ x 6.56’), 2 Twin Beds: 85 x 195 cm or (2.78’ x 6.4’). 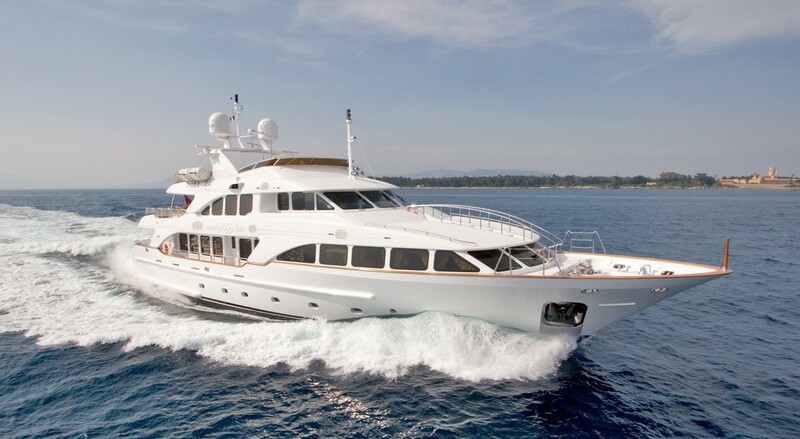 Luxury Mediterranean charter yacht AURA provides the following water toys and amenities: Tenders & Toys: Castoldi 17 jet tender, Yamaha GP800R Wave runner, kids training water skis, adult water skis, slalom ski, wakeboard, 2 x kayaks, donut, u-tube, banana boat, 3 x full dive sets (rendez vous diving only), snorkel gear. 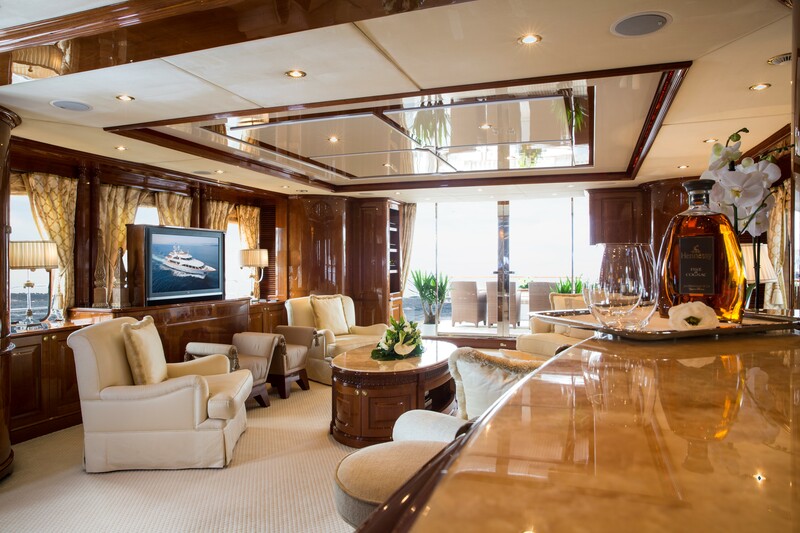 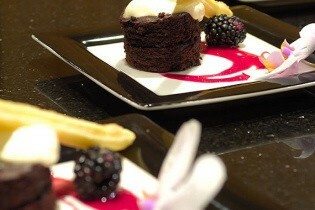 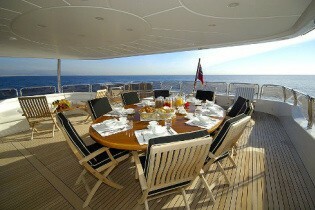 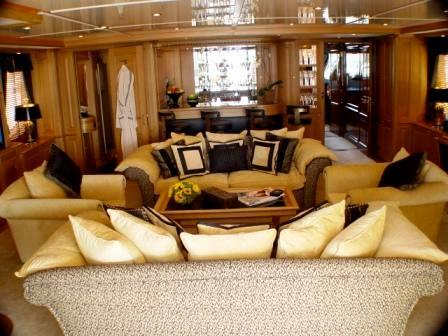 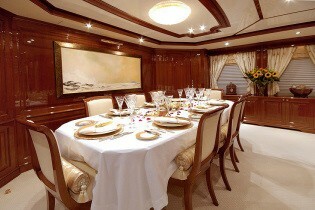 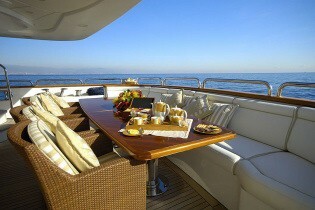 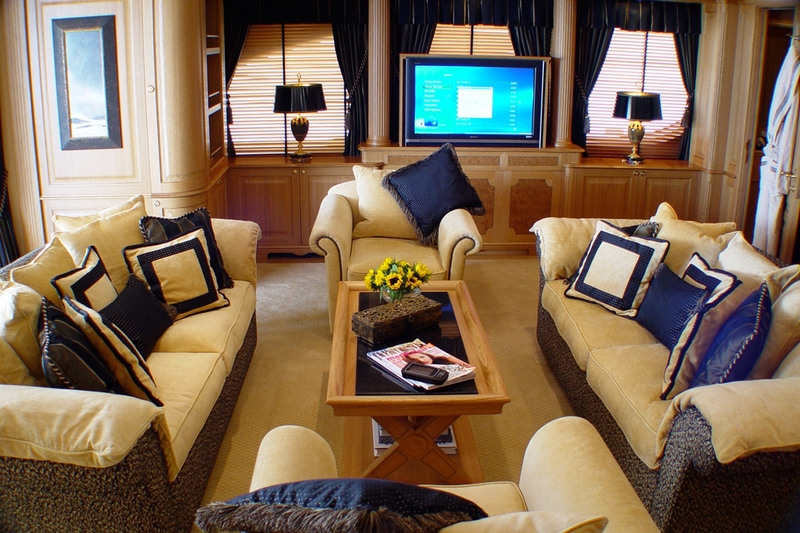 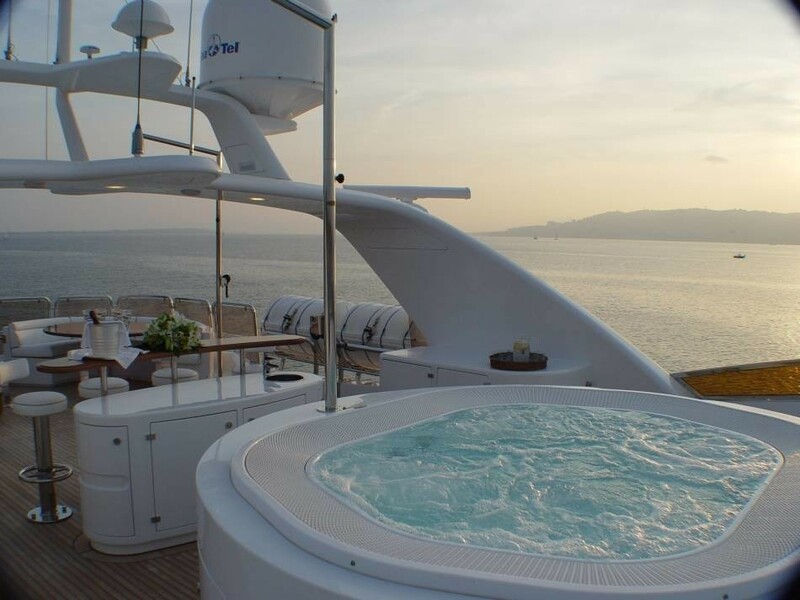 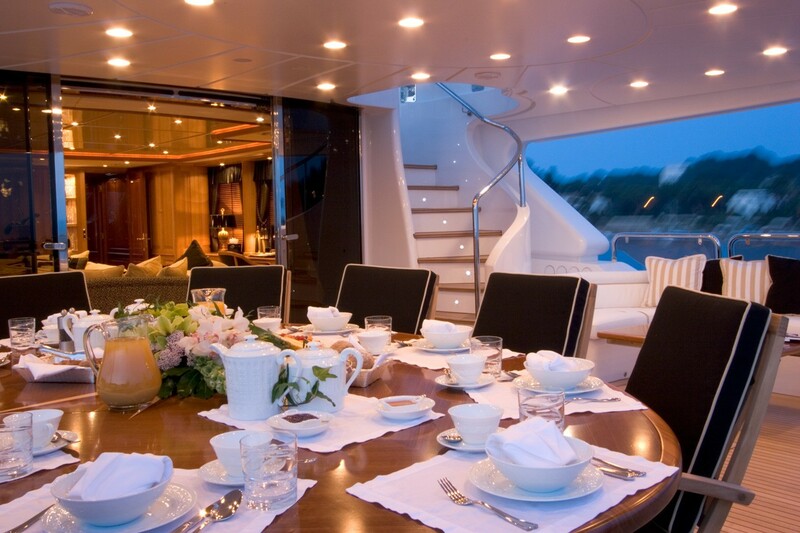 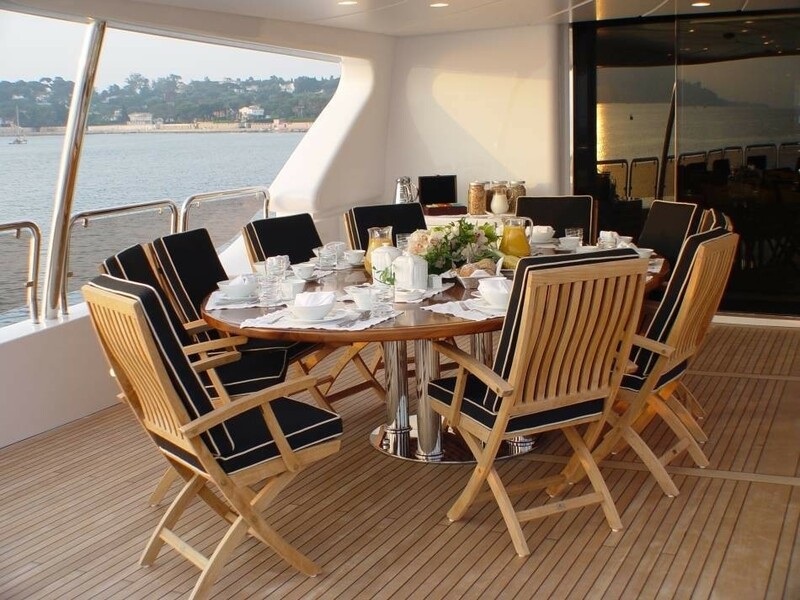 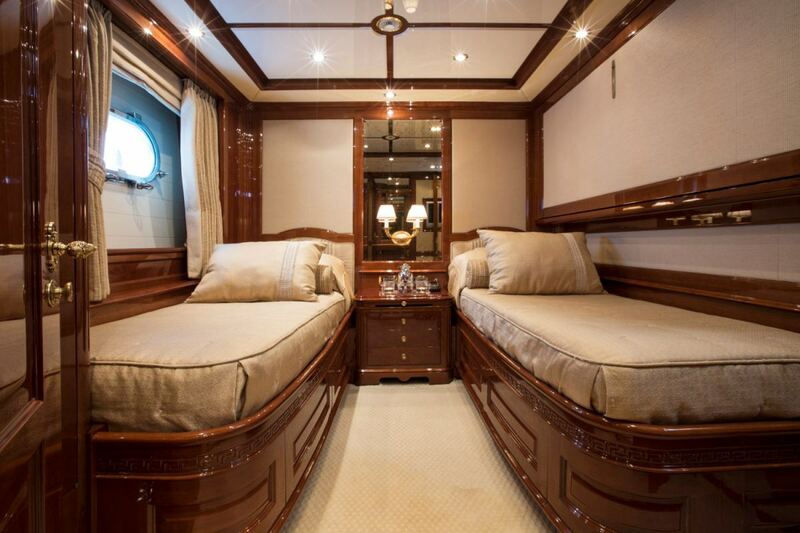 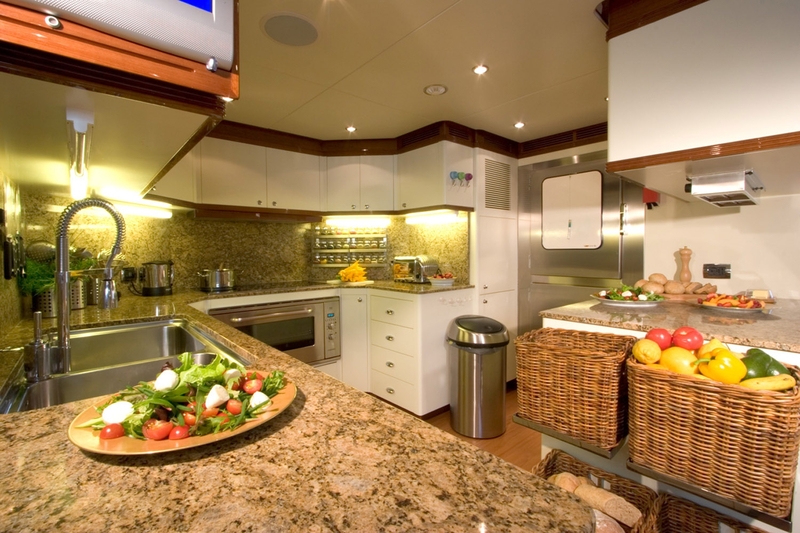 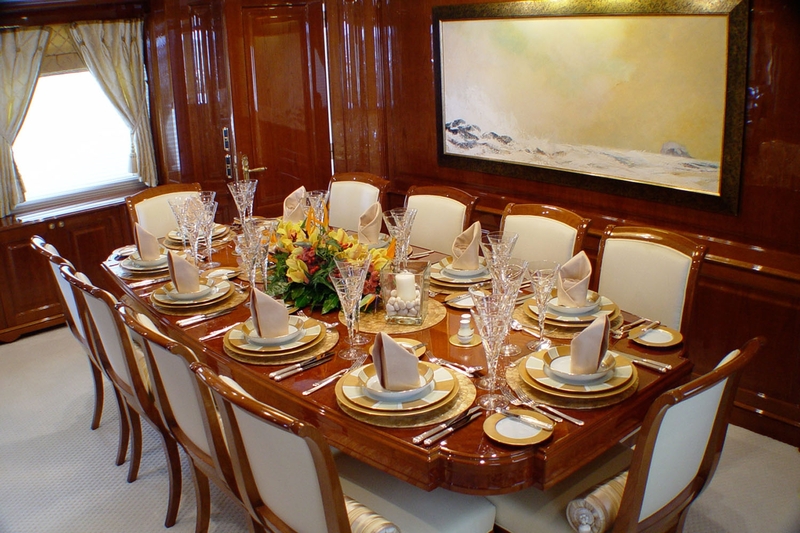 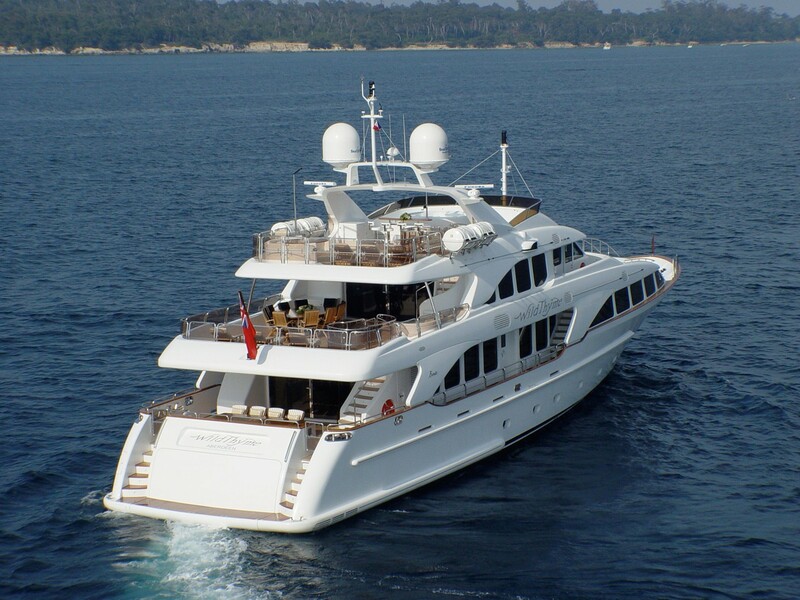 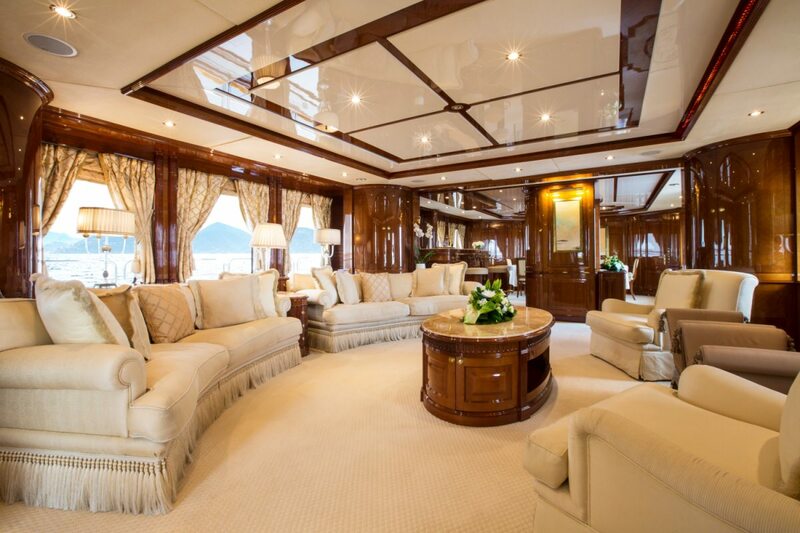 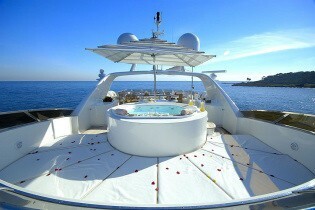 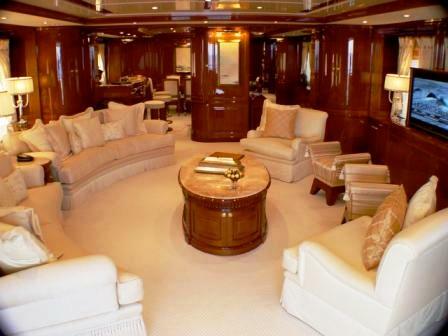 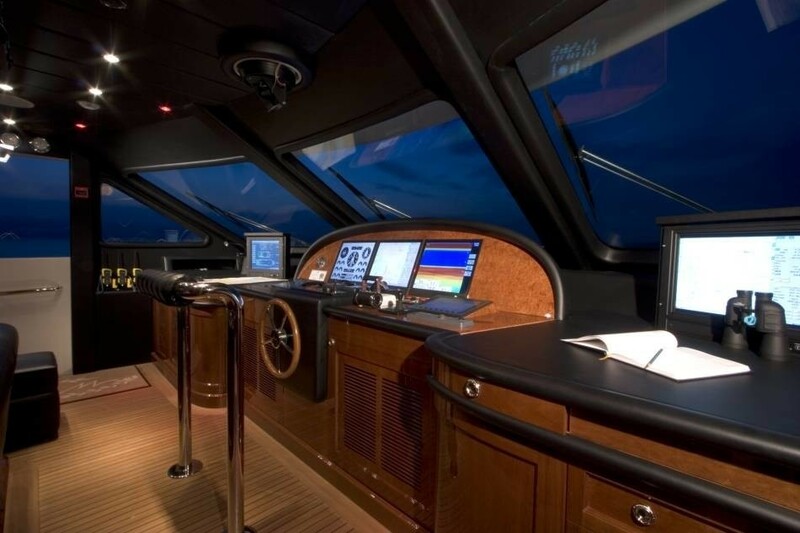 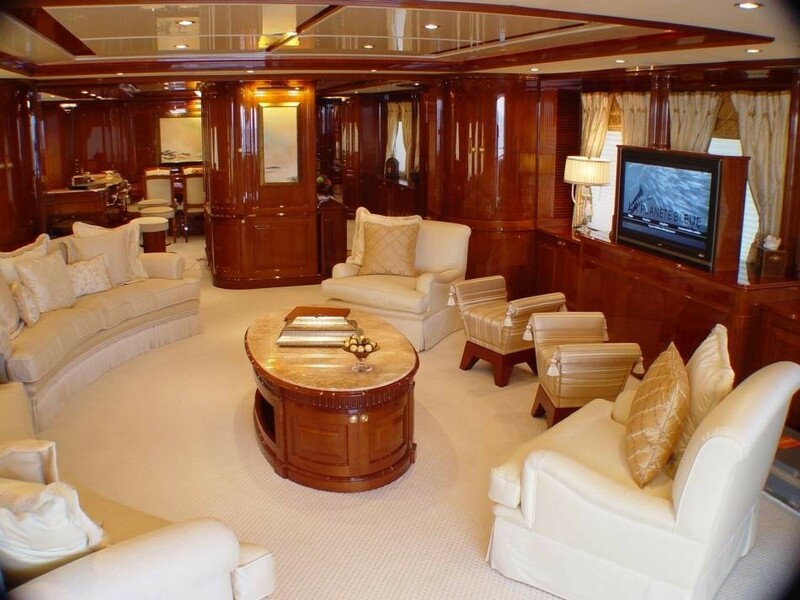 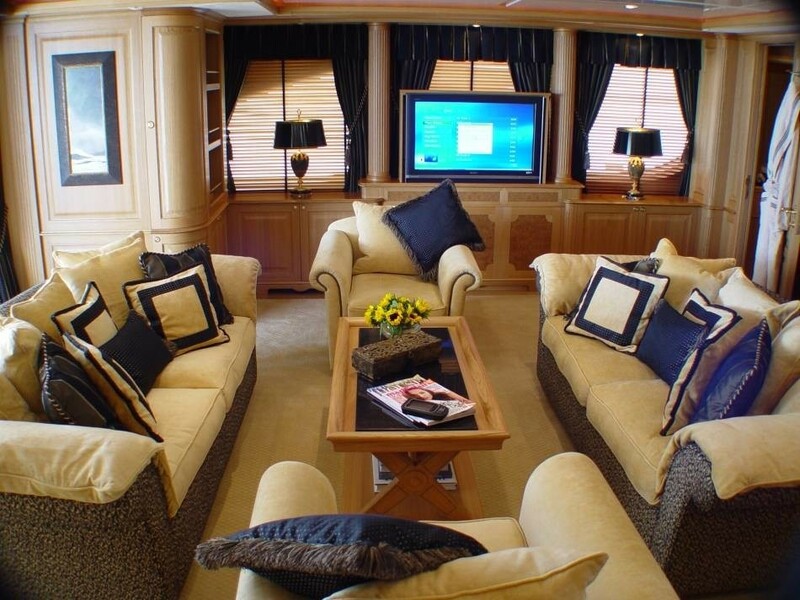 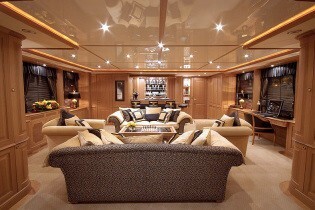 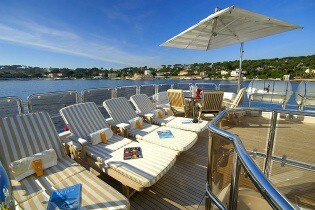 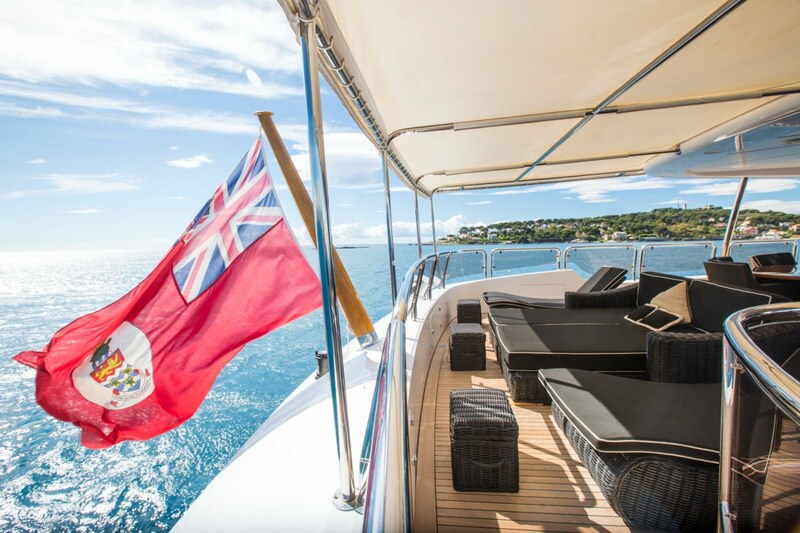 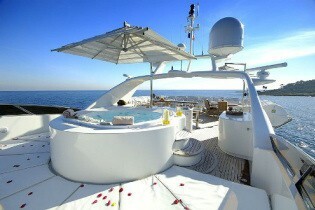 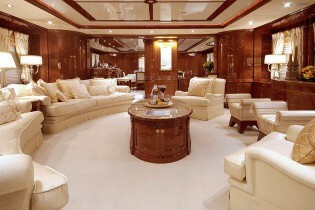 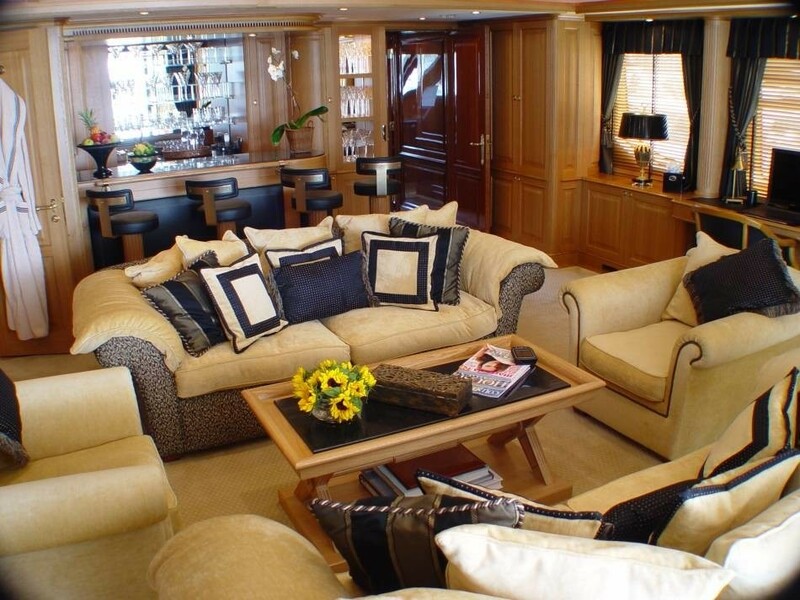 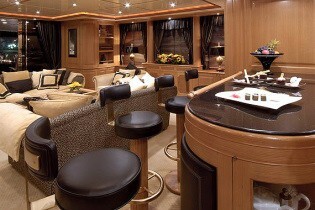 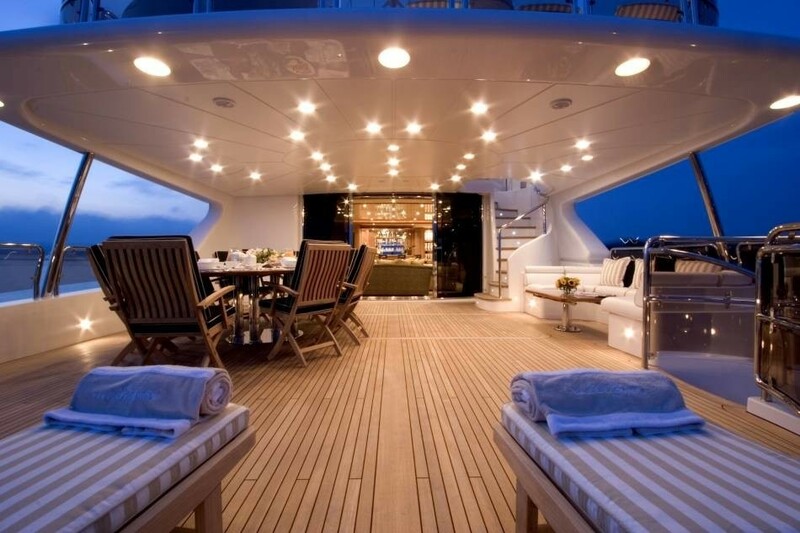 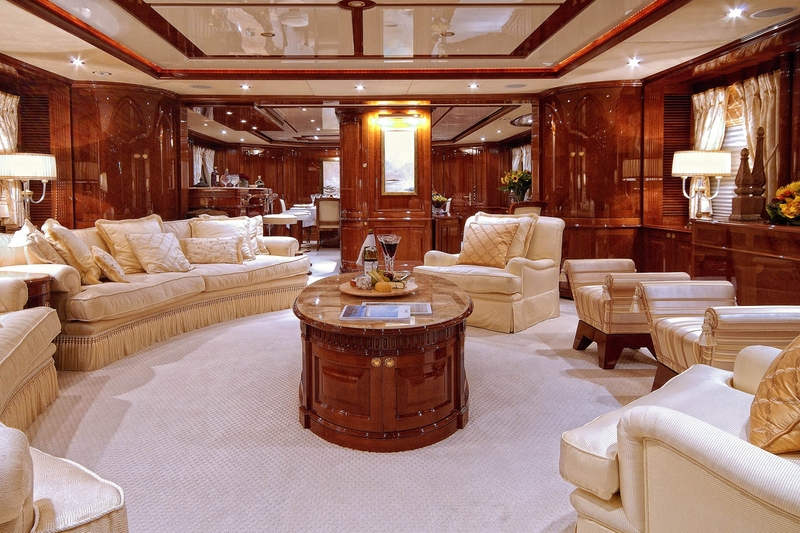 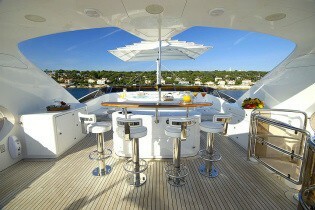 Audio Visual Equipment and Deck Facilities: Audio & video on demand throughout the yacht. 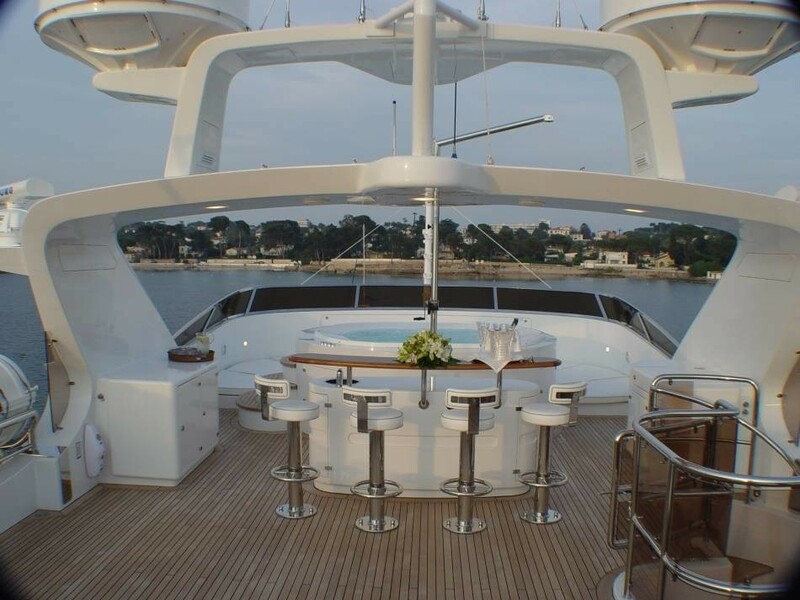 I-pod docking stations throughout, SKY TV, flat screen televisions in all cabins and lounges, portable TV + plug in points at all external seating areas including the sundeck, Spa Pool and barbeque. 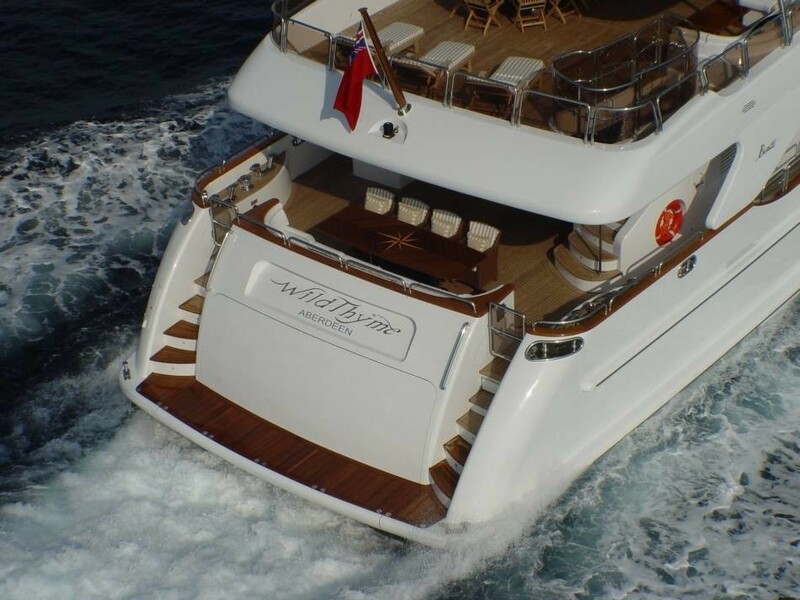 Communications: Wave Call, wifi throughout. 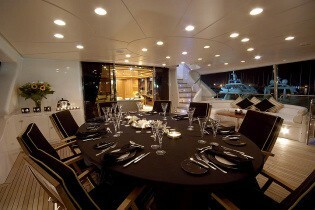 Engines & Generators: 2 x Caterpillar C30s 1550 HP engines 2 x kohler 55kw generators NO MOTION STABILIZERS.